You may be thinking, “Of all the electives available, why the heck should I choose one on law? Talk about boring!” Wrong. COM 361, Mass Media Law, Policy and Ethics is a class that is both interesting and will become beneficial to all communication majors in the future. Dr. Maria Moore teaches multiple sections of this class, and let me tell you, she is a fantastic teacher who has many years of experience in broadcast under her belt, yet she is very humble about it, and engages students using multiple teaching styles and intriguing case studies. Not only are the topics relevant for anyone in the communication field, but Dr. Moore also makes students treat the class like a job. Instead of research papers, students write memos and along with a syllabus have agendas. I am currently in this class and I have highly enjoyed it so far and am happy my major required it or I might have never thought about taking it. So back to the question of why you as a PR major should choose this as an elective. Dr. Moore has the answers. 1. Although PR students are not required to take Mass Media Law and Ethics, why do you believe PR students should consider taking this class as an elective? Studying Mass Media Law will help a public relations practitioner on three levels. First, many aspects of the law we cover have a direct bearing on the work environment and work product in public relations. Discussions of copyright, trademark, privacy, reputation and commercial speech are integral to the responsibilities of the PR profession. Second, other aspects of the law we discuss indirectly impact public relations as our focus on journalistic legal issues impact an understanding of the PR/News dynamic. Discussions of the free press rights afforded to news gathering may empower a public relations professional to better understand the framework a journalist encounters. The third area of impact for public relations is at the personal/human level. We all are impacted by issues of free speech, of privacy, of justice and we cannot avoid interactions with the law in our personal life through contracts we sign or regulations that impact our lives. 2. In what ways does this class apply to what PR professionals may face in the real world? vocabulary will build confidence for the aspiring professional, and when in the workplace, build credibility among coworkers. 3. I know you also teach Ethics, do you suggest PR students to also consider taking this class as one of their electives? place while Ethics adds in the nuance of what OUGHT to happen. This dynamic of MUST/OUGHT is a great tension that a mature, critical thinking professional navigates in the course of a career. As an instructor, I also teach the courses very differently with Law based in a great deal of information sharing (right brain work) and Ethics based in a great deal of discussion and analysis (left brain work) so a student taking both of my courses will experience my teaching styles in different ways that won't seem repetitive or redundant. Next time you are trying to figure out what electives you should take, do not just skip over COM 361.You will be able to learn from someone with years of experience and learn laws, which can easily apply to your future career. 1. What are you going to miss the most about our PRSSA Chapter? I am going to miss watching everyone's creative ideas and hard work come together. Being on executive board has given me the opportunity to work with five amazing people and oversee what a great PRSSA Chapter we have. 2. What has been your favorite memory from your experiences this year? That is a big question! I have had so many good memories this year. 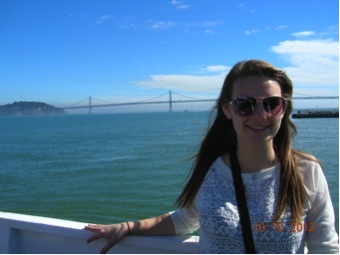 National Conference in San Francisco was so much fun. Our group huddle with Dr. Smudde before we presented during conference was a great moment. Also, semi formal is always a blast. I thought the Great Gatsby theme was so unique! 3. If you could meet one celebrity of your choice who would you meet and why? Jennifer Lawrence. She is so talented and seems so fun. I feel like I already know her and we are good friends just from watching her interviews. 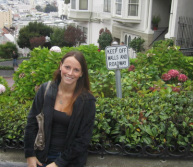 She seems like she is down to earth and I want to be her friend. 4. How do you balance everything you do with all of your involvement on campus? Oh my! Isn't that the question of the year? I think my agenda book has been a real lifesaver. Thank god for my family and friends too. I would not have gotten through this year with my sanity without them having my back and helping me with everything. 5. What is something most people do not know about you? Well if I tell you, then most people will know! But on a serious note, most people do not know I originally was a criminal justice/pre-law major. I kept criminal justice as a minor because I love the field and find it interesting. 6. What has been your favorite internship so far? 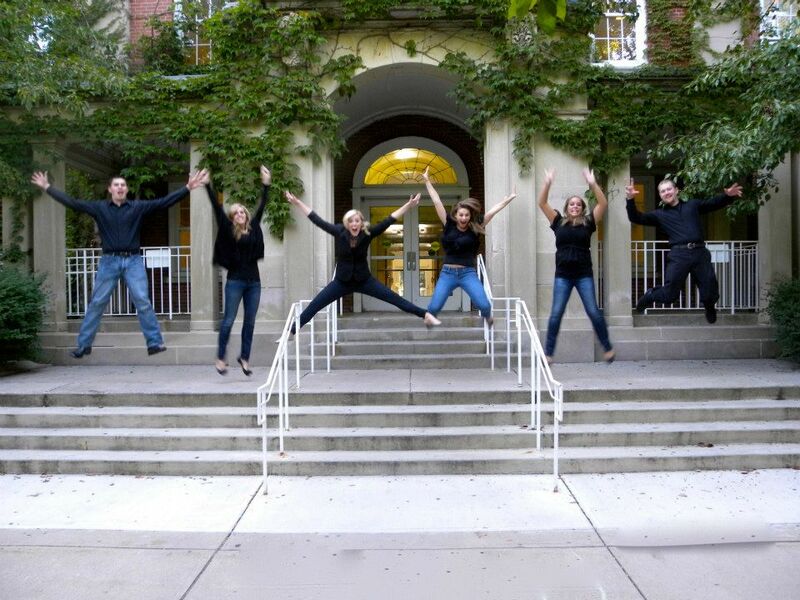 My favorite internship so far has been with the School of Communication Promotion and Development team. I was able to create relationships with SoC faculty and learn so much. Working with such a great team made me fall in love with the SoC more than I already had. 7. If you had a chance to travel anywhere in the world, where would you go and why? I would LOVE to go to Australia! I want to learn how to surf and touch a kangaroo and koala bear! Plus, everyone from Australia seems so happy, who wouldn't want to go there? 8. What is your dream career after graduation? My dream career would probably either be working with a record label publicity and communications team, or in some part of the FBI communications centers. 9. What class has been the most beneficial to you so far? I would definitely say COM 377: Campaigns has been more beneficial to me so far. Working with a real client and creating and pitching campaigns is experience most other classes do not give to the students. 10. What advice would you give to future ISU PRSSA Members? Get involved! The more you get involved, the more you get out of the organization. I have met so many wonderful people through PRSSA and I would not have had that opportunity if I was not so involved. 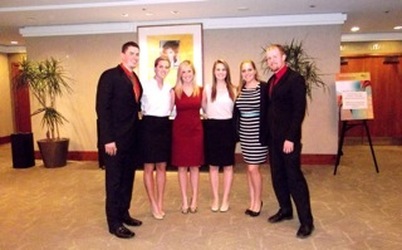 The executive board and I at the 2012 National Conference. 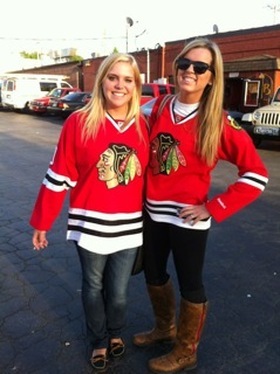 Kelsey and I getting ready to cheer on the Blackhawks! Myself and the rest of the SOCPD interns during Com Week. 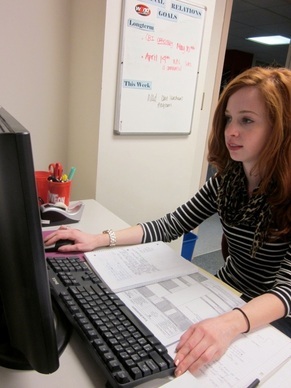 As the semester’s end draws near, many students are applying to summer internships or jobs. Since many public relations agencies and corporate public relations departments give a writing test during their application process, our Chapter held a workshop to go over the format to better prepare members for their future endeavors. Dr. Peter Smudde A.P.R., director of public relations program and ISU PRSSA’s faculty adviser, led a workshop on what these writing tests are like and how to prepare for them. He said most tests are timed and sometimes candidates cannot use the Internet. Though these tests cover many things students’ education teaches them, it is important to still prepare. Below is a list of things that could be covered within a writing test. Grammar. For example, knowing the difference between effect and affect. Effect being the outcome, oftentimes used as a noun. Affect typically means to influence, often times used as a verb. Spelling. My recommendation is looking up commonly misspelled words. Proofreading. Proofreading is not only an important skill, but knowing the correct proofreading marks is too. These marks can be found in the AP Stylebook. Writing a press release. Keep in mind the test is most likely timed. Writing a persuasive pitch. Sometimes applicants are limited to the amount of sentences or character they can use. It is important to stay updated with current events both worldly and PR related. 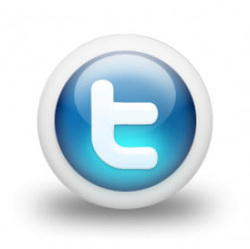 You may be asked to name blogs you read or people you follow on Twitter. Know about campaigns for the company you are applying to. 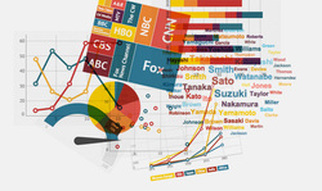 Be able to describe trends within the media. Do research on the company. Know important figures within that company and its mottos and culture. If it is a public relations agency, know some of its clients. Know the PRSA code of ethics and refer to it if there is an ethics section. “You have to imagine the possibilities, interact with your peers and ignite your future,” said Michael Taylor, founder and CEO of M.J. Taylor PR and Consulting Firm. One of many highly anticipated panels, the agency public relations panel featured three ISU alumni professionals with various levels of experience. The panelists gave advice about what it takes to make it in the agency world. 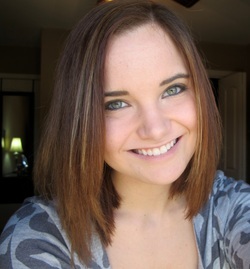 Michelle Murphy, account executive at Weber Shandwick, works in media relations. Some of clients she works on are Pedigree dog food and got milk? 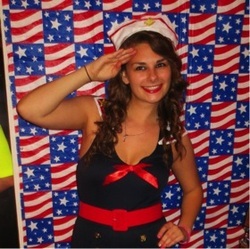 Jillian Collins, account executive at Edelman, works in new business and marketing, so essentially, Edelman is her client. Taylor, who works with sports charities to fundraise and find sponsors, talked about the non-profit side of public relations and how the experiences vary from small agencies to big agencies. Bigger agencies have more resources and that was the main difference between the two according to Taylor. Each professional described the benefits of being an intern and advised students to start gaining experience while in college. To stand out one, should always do everything with a smile, whatever the task is. One should be grateful for their position and demonstrate their capability to shine. The big piece of advice most students got out of the panel was to take advantage of opportunities. At Illinois State University, it is evident the School of Communication has astounding resources. It all begins with Tom Lamonica, the director of internship field experiences. Murphy and Collins talked about their experiences in college and how current students can control their future. They expanded with how their college experiences helped them in their career now. Both of them were a part of the School of Communication Promotion and Development team (best known as SoC PD or “the COM Week interns”) and COUNTRY Financial internships which helped them garnish the positions they have today. 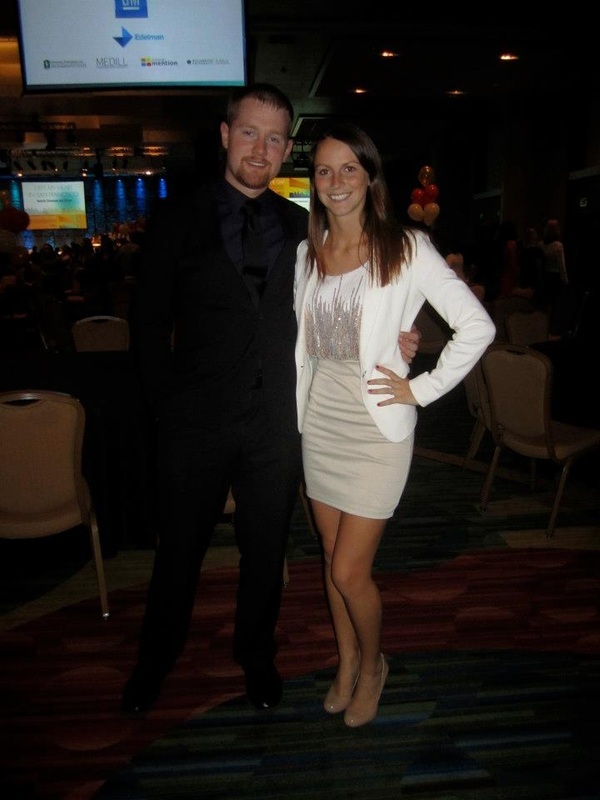 “COUNTRY was the most beneficial internship that we had while we were in school,” Murphy and Collins said. Some important attributes interns should have according to the panel are being well rounded, savvy, “comfortable with being uncomfortable,” specialists in one area and most importantly, be smart. Do not just think of the job, think outside the box and throw in your own flavor. Be your own person and do the job, but do it in a different way. Be transparent in what you want. University 's very own WZND. 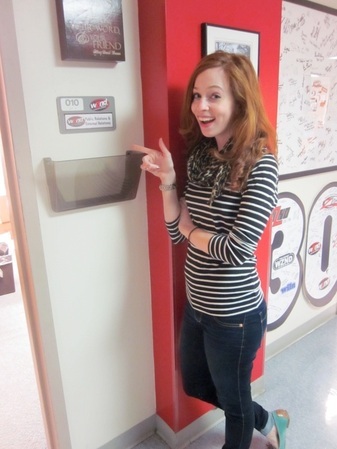 What does your job entail at WZND? I am a member of the public relations and external relations Staff at 103.3 WZND, Illinois State University’s student-run radio station. In this position, I work with the PR and ER Directors to help promote the positive image of WZND to ISU and the local community. There’s a lot that goes into it, including planning station events, submitting award and scholarship applications, editing newsletters, creating scrapbooks, executing philanthropic activities and of course, writing press releases. What was the process to receive your position and do you recommend it to only public relations majors? I attended an informational meeting at the beginning of the semester about working at WZND. Each department spoke about their roles and responsibilities and how many staff members they were hiring. I knew I wanted to do something involving public relations, so I only interviewed with that department. The interview process was very straightforward, and I found out a few days later I was accepted to the staff. I definitely recommend working at WZND to PR majors – there actually aren’t very many of us over there! Most of the staff are mass media or broadcast journalism majors, including all of the PR and ER directors. It’s a wonderful experience, whether you want to work in radio or not, and everyone there is so great. Why did you want to get involved with the radio aspect of public relations and will you continue in this direction? Honestly, I was just looking to get involved with anything PR related I could! I had just become a PR major at the beginning of the semester, but I knew I loved it and wanted to dive in and get as involved as possible. I don’t see myself continuing to work in any kind of broadcast field, but my job at WZND has given me a lot of good basic public relations skills, especially when it comes to writing. That can easily transfer over into other positions, like agency work, which is my ultimate career goal (at the moment, anyway). What has been your favorite philanthropic event you have helped plan and why? I loved planning the Easter Egg Hunt with the ISU Child Care Center. It’s such a fun event! Unfortunately I could not actually go to the egg hunt because I had class at the time, but even just helping put everything together was a lot of fun. What tools are you going to take from this position to help you on the new PRSSA executive board team? A lot of what I do at WZND is very close to what my duties will be as historian. 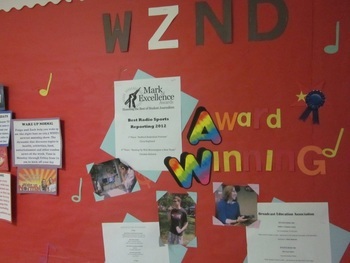 I helped create a WZND scrapbook and designed WZND bulletin boards in Fell Hall – two historian job duties for PRSSA. One of the biggest things that will help, though, is the event planning experience I have gotten at WZND. Putting together events like the Broadcast Banquet and Easter Egg Hunt will definitely help me plan and organize philanthropic activities for PRSSA next year. The bulletin board I update. Chicago weatherman Mike Caplan, a graduate of Illinois State University, was a keynote speaker during COM Week 2013. His lighthearted humor captivated his audience as he told stories about his journey into becoming a weatherman for ABC7 News. “ISU was the launch pad to propel me onto the road I took,” said Caplan. 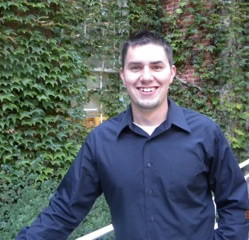 He transferred to ISU from a community college and the communication department piqued his interest— the WZND radio station in particular. He even became the ISU Radio Speaking champion in 1983. One of those classes was broadcast news. 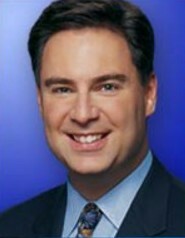 Intrigued by the TV side of things, Caplan opted to work for TV-10, where one of his first jobs was to report the weather. Having participated on the speech team in high school, speaking in front of others seemed to come naturally for him. He did so well that it was not long before he was made the official weatherman for ISU. After graduating in May 1984, Caplan quickly secured a job in Rockford working as a general assignment reporter. A monumental moment in his career was being able to interview Ronald Reagan about his experience playing football at Eureka College, which at this point, had only been done by one other journalist. He described his interview with President Reagan as a great experience and said the President had everyone in the room laughing. After a few more jobs along the way, it was New Year’s Eve 1993 when he began anchoring at ABC7 and has been there ever since. The audience even got to see clips of him in action during his speech; Caplan clearly enjoys what he does. Caplan advised students reach out and start networking with professionals. After all, it’s not what you know but who you know. He also pointed out the resources students have on campus. “The more things you can expose yourself to here, the better chance you have of getting that first job,” he said. The first job you get may not be the ideal job, but Caplan encourages students to take it because that is how a new graduate can get their foot in the door for the field they want to go into. Caplan’s easygoing disposition made for an overall pleasant and enjoyable keynote speech for COM students. Were you a public relations major when you received the public relations chair position for Pride? I accepted the position in April 2012 and was not yet accepted into the major. I had taken COM 178: Introduction to Public Relations in the spring of my sophomore year and I knew that I had a niche for writing. 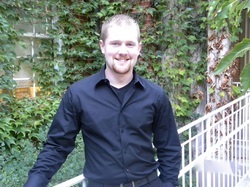 His class justified my passion for writing and my drive to become a public relations major. I was a member of Pride since the beginning of my sophomore year and there was a public relations position open on the executive board. I thought that it would help expand my knowledge in PR and it would also be something to add to my resume. What are some of your responsibilities as the public relations chair for Pride? My responsibilities varied depending on what was going on in Pride. In the fall, we had Festival ISU, so of course I promoted Pride by getting handbills and fliers to have at our table. I was in charge of having the meetings and dates on the handbills and distributing those across campus. I was a large part of this year's Charity Drag Show where I created all the advertisements across campus, which included the window clinger in the Bone Student Center, Facebook ads, Twitter updates and posters. The event was receiving a ton of attention from the media, which was new to me. It was really fun to be on camera or on the radio promoting our events! What has been your biggest accomplishment or milestone as Pride public relations chair? As the public relations chair, I’d say my biggest accomplishment was the Drag Show. It was Pride’s 15th annual show so we knew we had to hit this one out of the park. I think we exceeded our expectations. I was on the planning committee for that and it was awesome to work from the inside. What has been your favorite moment as a member of Pride? My favorite moment this year from Pride would definitely be interacting and meeting new members. I make friends really easily but to have such an impact on the members whether they were old or new was so invigorating! How do you plan to use your leadership skills in Pride for your newly appointed position as our Chapter’s treasurer? I learned quite a lot as public relations chair, so I will be able to contribute that knowledge to the executive board and Chapter as a whole. 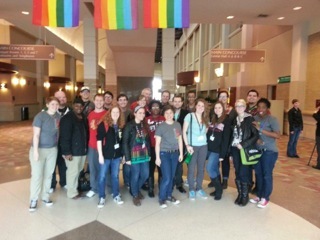 My experience with Pride is pretty unique, so I will also have a different perspective than if I had not been so heavily involved with another student organization. I know so many students in the School of Communication and hopefully my personality will allow me to interact with current members and help recruit new ones. I’m working with five amazing girls and I’m excited for the up and coming journey. Senior year should be a blast! 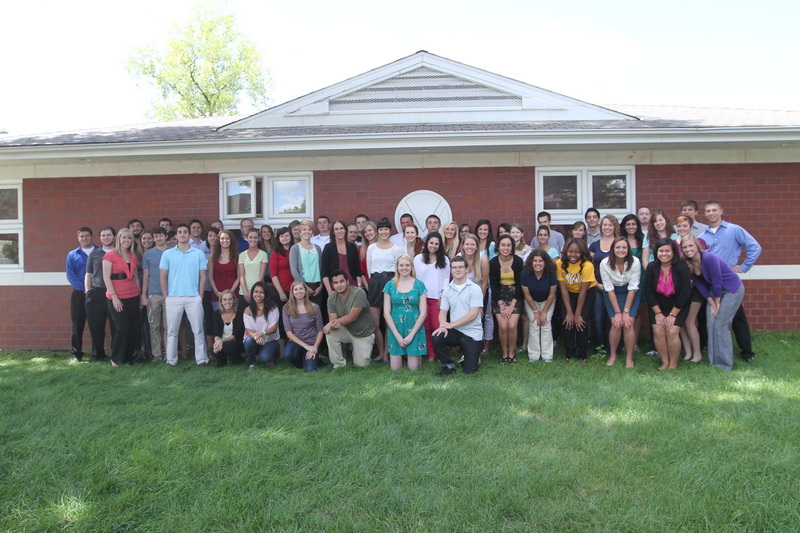 End of the school year picture, 2012. Barbie is for girls and LEGO is for boys, right? 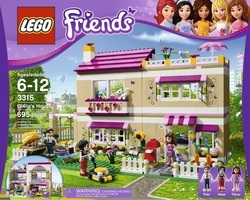 Not anymore according to the new line of LEGO launched in December 2011 called LEGO Friends. The company, whose product has previously spoken to boys in the form of themes such as Star Wars, Batman and Mario Brothers, is changing things up in the hopes of targeting a new market of young girls. In response to the criticism, LEGO has stated the decision to create a new line of girl-friendly LEGOs, based on four years of research about how boys and girls play.The goal was to create another option for girls when they reach the “princess phase,” which is around the age boys begin to play with LEGOs. Just weeks after BradWieners of Bloomberg Businessweek published an article investigating the new LEGO Friends, a 1981 LEGO ad surfaced. The ad features a photo of a young red-headed girl wearing overalls and sneakers and holding a LEGO creation. The ad, which was quickly spread around the social media world features the phrase, “What it is … is beautiful.” It received significant attention, with its nostalgic look and message. The ad contrasts the strict gender roles seen in the current LEGO and LEGO Friends, by featuring a girl dressed in what could easily pass as boy’s clothing, and holding a large LEGO tower, not a LEGO beauty parlor. The message is simplistic and heartwarming. The LEGO Company is trying to tell the public they do not support gender stereotypes by releasing this gender-neutral ad, but feminist groups are still unhappy. Parents, however, are pleased overall with the product, a fact the LEGO Companyis choosing to focus on since parents are their biggest customer. Needless to say the line will continue, anda 2013 line of “School’s Out” themed LEGO Friends is expected, including a LEGO school and extra-curricular activities such as dance and soccer. While I think it is great LEGO is trying to appeal to girls, I also think the LEGO Friends are stereotypical because it sends a message that girls are supposed to only be interested in certain toys. Personally, I played with LEGOs as a child, even though they were not feminine and pink and never thought twice about it. In the future, the LEGO Company should consider more carefully the message it is sending to girls with its product. 1. What is your biggest accomplishment at ISU? Maybe it is because I just ordered my cap and gown, but I have to say graduating. I think a lot of people take graduation for granted. I know people who do not even plan on walking in May. In college you are surrounded by people who are also going to graduate, so it is easy to lose sight of how big of an accomplishment that really is. 2. Who do you admire most and why? I admire a lot of people. It would be hard to pick just one, so I will list a few: Jim Carrey, Neil Armstrong, Greg Giraldoand Nikola Tesla. Jim Carrey lived out of his dad’s car growing up because his family was so poor, only to become the first actor to be paid more than $20 million for a single movie. Neil Armstrong is one of the most humble human beings I have ever read about. Greg Giraldo achieved a near perfect score on his LSAT, earned a bachelor’s degree from Harvard Law School and gave that all up to pursue his dream of being a comedian. If you do not know why Nikola Tesla is awesome you should look him up. 3. Where do you see yourself after graduation? I would like to work in agency PR for a few years. I have always seen myself ending up in Chicago because I would like to stay close to my family. However, after this year’s National Conference in San Francisco I am more open to the idea of taking a job outside of the state for a few years. 4. What will you miss most about PRSSA? Saying “the people” seems like a cliché answer, but it is the truth. I love the people I work with. There are a lot of things I will miss, but none of them would have ever been what they were without these people. I will miss agency tours, workshops, socials, Milner Library sessions and conferences. One thing I will miss that people may not guess is seeing younger members take internships and leadership positions in PRSSA. It is hard to understand the feeling that comes with knowing you may have helped someone get on the right track professionally. 5. If you will get the opportunity to travel anywhere in the world, where will you go? I would have to say Ireland. I think it is ingrained in my DNA as a redhead and as a Kennedy. I have always been fascinated with the ancient castles, beautiful landscapes and the culture. 6. What are some of your hobbies and do any of them relate to PRSSA? One of the things I regret not spending enough time on in my time at ISU is hobbies. I actually used to go paintballing regularly and even considered joining ISU’s paintball team. We actually have a great team and won the National Collegiate Paintball Association national championship in 2008. I even bought a new paintball gun before coming to ISU. Between work and school that brand new paintball gun has sat collecting dust in my closet. In hindsight, I wish I had spent more time with that hobby and joined the ISU team. Who knows, maybe they could have been a client for PRogressive Image. 7. After holding different positions in PRSSA, what advice would you give to anyone going into a leadership role? Talk to the person who held the position before you. Talk to them before you apply, after you get a position and keep in touch with them via email throughout the year. You will be suppressed how often and willing they will be to help you. This applies to people in other leadership positions in PRSSA as well. 8. Who is your favorite professor and what class did you have with him or her? I do not think I can pick one favorite. Tom Lamonica sparked my interest for public relations in COM 178, Dr. McHale helped nurture and challenge my writing skills in COM 161 and Dr. Hayes gave me the opportunity to put everything I have learned in the public relations program to use with a real world client in COM 377. 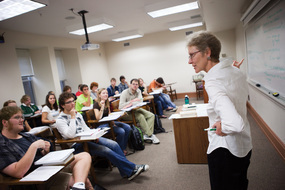 We are lucky to have so many gifted professors from different backgrounds in our program. Everyone has classes they hate, but I think we are truly blessed to have so many classes we love. Also, I have to give an honorable mention to Dr. Moffitt for COM 321. She may be the only professor who could have me write a 76-page paper and still love her class. 9. What is something most people do not know about you? I am a giant comic book nerd, and by giant I mean “turn the Pym Particles up to max” giant. (Pym Particles are a rare group of subatomic particles, which increase or decrease the size and mass of living beings. They where discovered by Dr. Henry Pym aka “Ant Man” hence, the really bad joke). 10. If you had an entire day to do whatever you wanted, what would you do? I had a few of these days recently over spring break. My favorite day was when I took my Mom and little sister up to Chicago for they day. We went to Lou Malnati's Pizzeriaand had some of the best pizza I have ever had in my life. For dessert we went to The Melting Pot. It was one of the best days I have had in a long time. It was not a completely unproductive trip, as my 13-year-old little sister finally gave me permission to move to Chicago after I graduate. 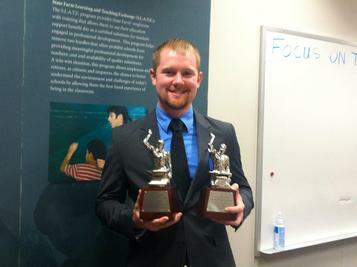 "Posing with two of State Farm's Silver Anvil Awards on our cooperator communications tour of their headquarters." 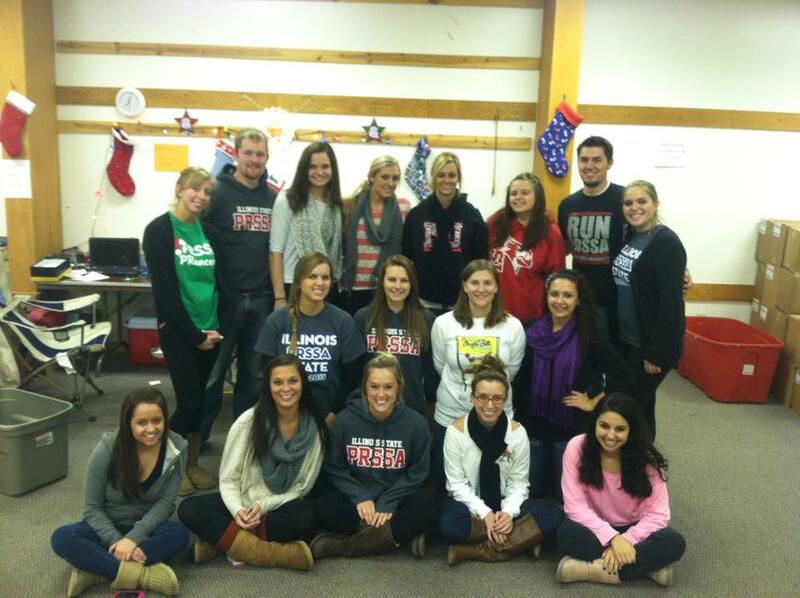 "ISU PRSSA volunteering for Operation Santa." 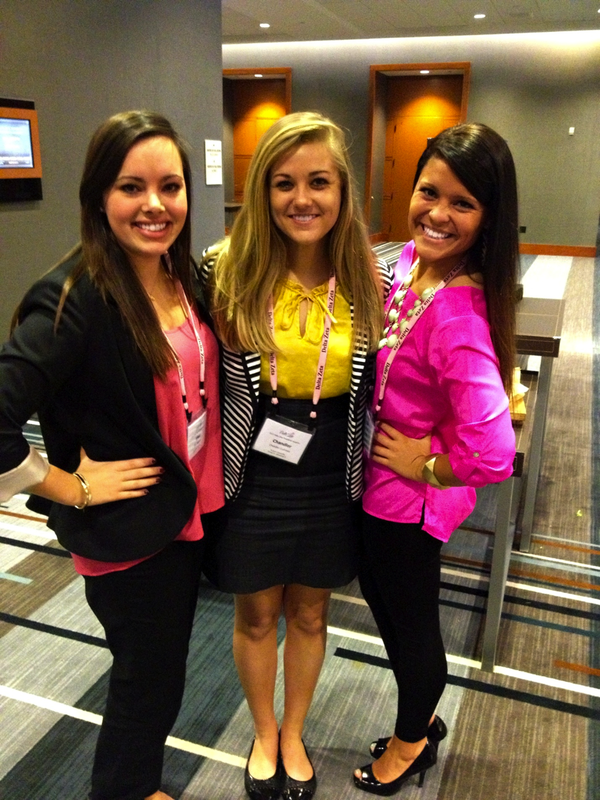 "Presenting on “Building a Strong Executive Board” at PRSSA National Conference." "Hopping Through the Holidays social." 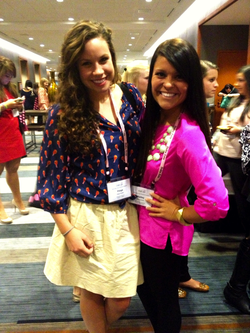 "Hanging with Hailey Lanier at National Conference." "Getting a jump start on the year with the rest of E-board." Pitching your story ideas can be a nerve-racking task, but it is all in your approach. 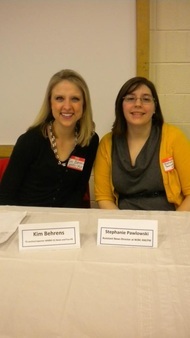 Experts Kim Behrens and Stephanie Pawlowski spoke at a recent Chapter meeting and answered questions about the best ways to go to a company with yourpitch. 1. Network. Follow the company on Facebook or Twitter. Introduce yourself and always be ready to pitch a story. 2. “Call and then email.Or email and then call." Whichever you decide to do first, contact the company at least three to five days before an event is about to take place and follow up at least 24 hours before the event. The best hours to contact a radio director are between 9 a.m. and 3 p.m. It is okay to have more of a conversation when pitching to radio and the actual pitch time is not important. 3. Be timely with your pitch. That is, with your initial call or email as well as the actual story you are proposing. Be sure the story is relevant to the company you are pitching to, be specific and always be aware of what is going on in the news. 4. Localize your story. Whatever you are pitching, make sure there is a local angle that will appeal to resident viewers, readers or listeners. 5. Do not be afraid to reach out and stay in contact. Lay the groundwork for a relationship with someone in the media and be consistent. 1. Do your research and know your target. The best way to get your pitch picked up is to establish a relationship with someone in journalism—your story is much more likely to be noticed this way and will garner more consideration. The best way to get a company’s attention, whether it is TV, radio or newspaper, is to know whom you are reaching out to and to address the person by name. 2. Brainstorm.Always put together a list of fresh story ideas in order to stay current. 3. Know when to make your pitch. In television, your best bet is to call a company within mid-morning hours. Keep it brief and to the point. 4. Relate it to sales.You are basically tryingto market yourself—when creating a new interpersonal relationship with someone in PR or the media, make eye contact and offer a handshake. Do not feel inferior or overwhelmed by the media. They need stories as much as you need them to be picked up! 5. Be friendly and fearless.Get beyond the initial fear of putting yourself out there and just send the email or make the call and introduce yourself as a new person in the PR world. The power of a phone call can go a long way. In essence, it is really all about educating yourself regarding the field you want to go into and learning how to establish relationships in the professional world. Behrens and Pawlowski’s tips can only lead to success for students as they apply for internships or jobs in the near future. Fritzen, along with Jim Nowlan, former state legislator and Dara Brockmeyer, district office director for Dan Brady all spoke at the political communication panel during COM Week 2013 to a group of students who were eager to learn. The theme of the panel revolved around the role of social media within campaigning. There was a general consensus that in running a campaign, social media is a must. “It’s much easier to communicate this way…the message gets sent directly to your audience rather than hoping it gets through the newspaper and TV stations,”Brockmeyer explained. This way is efficient, but is it the most effective? With the younger generation, absolutely, but it is also important to remember the traditional ways of campaigning. Nowlan explained how it is vital to “make sure the values are being displayed in an attractive way.” Using cross media can help you achieve this. Create yard signs, newspaper inserts, direct mail and print handouts. Fritzen explained how sending emails can get easily dismissed, especially if who you are sending it to has a spam folder. Now, with something like a post card, one would have to physically touch it before they decided to dismiss the message. The panel gave great advice that can be applied to not only students with an interest in political communication, but also to those in public relations. Whether you decide to run a campaign, participate in one or simply stay informed, it is important to have your heart in it, know why you are doing it and have a purpose. 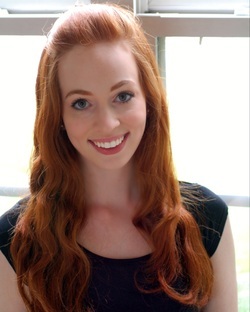 Hailey Lanier, junior PRSSA member recently received a research assistantship with the Illinois State University School of Psychology. What you will be doing as a research assistant? As a research assistant, I will be helping with the Psychology 290 class on research methods. The class is studying blind and deaf dogs and various ways to train them. Their goal will be to increase the dogs’ obedience and skills. I will also be helping the teacher research the cognitive differences between blind and deaf dogs and dogs who can see and hear. Why did you choose to apply for a research assistantship? I decided to apply after my mom sent me an article about the program. Once I found out about what Mrs. Farmer-Dougan was helping with I knew I wanted to be a part of it. I have always been very interested in animals so I thought it would be a great opportunity for me. What was the process you had to go through to receive the research assistantship? Since I am a psychology minor and can't get into the class (it is major-only), I emailed the teacher about how I could help out. She presented me with the opportunity to be a research assistant. I had to fill out paperwork, and had an informational interview about it before I was all set up. I'm very excited to start working with her and the dogs, and I hope I am able to make a difference by developing research. What made you choose to do you research on blind and deaf dogs? At my internship with the Humane Society of Central Illinois there were a few deaf dogs who were available for adoption. They were harder to train, and it took much longer for them to be adopted. I am excited to help train these dogs not only so they are better behaved and more likely to be adopted, but so that we can also learn new training methods to help dogs in the future. Many times these blind and deaf dogs are called “lethal whites” as they do not have enough pigment in their skin or eyes. Many are deemed “worthless and untrainable” and are euthanized because people do not understand how to properly train them. They are just as sweet as other dogs, and can be trained with a little extra effort. I am hoping that through this research we will be able to help put an end to the unnecessary euthanization of these dogs. What are some of the classes you would recommend other students to take that are interested in a research assistantship? The specific classes that work with the dogs are PSY 331 and PSY 290. However, if students want to do research on a different topic, I would encourage them to find a topic they think is interesting, and then find a teacher who teaches a class on that topic. Don’t be afraid to reach out to them, I got my assistantship simply by asking the teacher about what I could do to help. How has PRSSA helped you achieve this position? 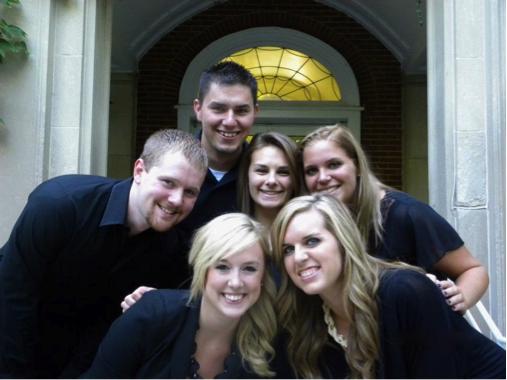 PRSSA helped me develop professional skills and confidence. This enabled me to contact a professor asking how I could help even though I knew the course was major-blocked. Though some people may find contacting professors and professionals intimidating, I am very comfortable with it due to both things I've learned as a member and past leader of PRSSA. I hope through my conversations with other members they may want to do something similar, such as volunteering at an animal shelter. 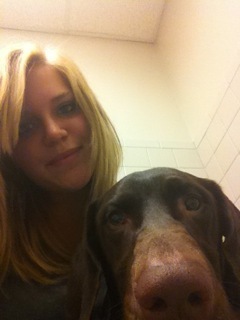 I am an active volunteer at the humane society of central Illinois, and it's a very rewarding experience. As the cold weather is finally coming to an end, March brought back the sunshine and flowers as spring is approaching. For many sports fans, March also marked the return in one of the most exciting times for college basketball. 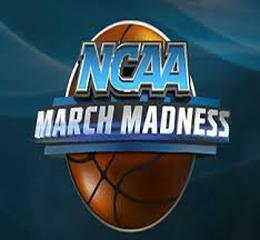 March Madness finally arose and fans were anxiously watching the games. The article Become A Champion Of Diversity During March Madness And Beyond cannot help to take notice of the increasing diversity of the NCAA athletes and the public relations industry. The author of the article, Gail Dent, the associate director of public relations for the NCAA and member of the PRSA Diversity Committee, wrote about the inclusiveness of both organizations. Our society is becoming more diverse every day. We are more accepting of other cultures and religious backgrounds than in the past. During March Madness, everything from the players, fans and coaches is a melting pot. Many years ago, minorities were not allowed to play basketball professionally. As we become more inclusive, sports will continue to see more athletes with diverse backgrounds. Dent says the public relations industry, like sports organizations, should plan ahead for the diverse changes in the industry. 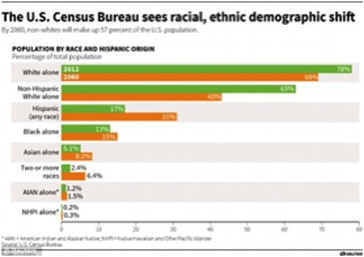 Public relations practitioners should plan for an increase of minorities in the field. Not only that, they have to be ready to show their publics and clients that they welcome a variety of different opinions. The industry should show public relations professionals are not a one of a kind mixture. Dent said the PRSA Diversity Committee is working hard to make sure the industry is ready for this change. On the PRSA Diversity Committee site, they offer tips and advice to help other PRSA chapters increase their membership diversity. As an African-American aspiring to be a public relations professional, I love hearing how the industry is preparing for and encouraging more diversity. It is inspiring to hear PRSA has a broad view of how to welcome professionals and clients to the industry. This is not only what the future will look like for the NCAA, but for all professions and fields with PRSA leading the way. Kaylin Smith, senior PRSSA member recently started her own photography business, Kaylin Smith Photography. My passion for photography started when I received my very first digital camera on my 14th birthday. I lived in a small town and filled my free time taking photographs of the flowers, insects, animals and friends in the backyard. From there I started to upload my photographs on a blog to get advice on my photography. I got a many positive comments and realized I was actually had a skill for taking pictures. Ever since I have continuously taken photographs and now have made it a side business. What skills have you used from PRSSA to start your business? I have always been quite a shy person. After receiving my current leadership position in PRSSA, I have gained confidence in talking to new people and delegating tasks. As a photographer I will have to communicate with potential clients as well as direct them into positions for the photographs. Gaining these skills will help me build my clientele and make me an even better photographer. Have you been able to use your photography skills for PRSSA and how? I did not want to take over the historian’s job of documenting PRSSA events, but I have tried to use my photography skills at socials. I did this by adding collages from our socials to the newsletter, so I have been using my skills to take the pictures and pick out which photographs look best together. What has been the biggest challenge about starting your own business? I recently started my own business photographing my friends and family for a small fee. However, I am at the point where I would like to expand my business. I have been evaluating trying to figure out what would be a reasonable price for potential customers. My biggest challenge at this point is having to figure out how to price sessions. What has been your favorite job so far and why? My favorite part of being a photographer is using my creativity and being able to capture moments that will last forever. Recently, my best friend had her first baby and I have had so much fun finding new creative poses and capturing how much he has grown in the past five months. It is not just a single job but one that I know I will be doing for years to come, which I find very exciting and rewarding. For more information on Kaylin Smith Photography please contact her at kaylin.smith91@gmail.com. I take pictures everywhere I go. 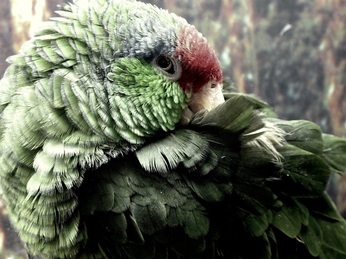 This is a parrot from the Miller Park Zoo here in Bloomington. 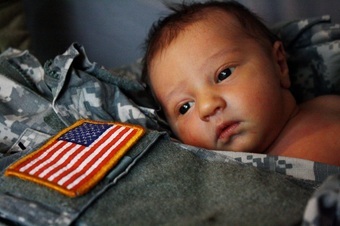 One of my very first newborn photographs of Chayton my best friend’s baby boy. 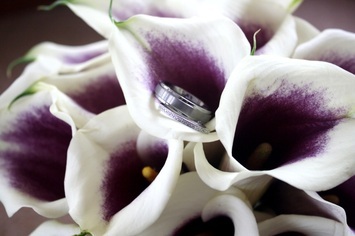 One of my favorite photographs from my second wedding for Krista and Jeremy last fall in Tremont, Ill.
Krista and Jeremy’s wedding rings in Krista’s bouquet. My niece, Maddison and nephew, Brycen taking posing for pictures for my sister last year on Mother's Day. Photograph of Chayton for his first Christmas. Ebonne Just, account supervisor of public relations at The San Jose Group in Chicago, recently met a few of our PRSSA chapter members at the regional conference, PR the Chicago Way. She was a multi-cultural guest speaker at the event and accepted the offer to write a guest blog for our Chapter. For more information, visit http://www.thesanjosegroup.com. As with any marketing assignment, the first step is to clearly identify the audience your brand is trying to engage. In multicultural communications this step is crucial. Beyond knowing the typical characteristics of your target (race, gender, age, income), it is important to understand this consumer on a deeper level. What drives them to achieve their quantitative and qualitative personal goals (family, wealth, religion/faith)? How do they view themselves as part of the total market (blue-collar, entrepreneur, spiritual leader, social advocate)? How has race or ethnicity influenced their experience living in the U.S.? Understanding these cultural nuances- the characteristics that exist beyond general appearances which distinguish ethnic and racial groups from the traditional American ideal- builds a platform from which a communicator can deliver a credible message. -Who is the most credible secondary source to deliver the message (i.e. spouse, parent, teacher, friend, priest, etc.)? -What is the best way to reach them (television, print, social media, radio, etc.)? -When and where is the target most likely to be open to receiving the message (morning/noon/night, in the car to and from work, while relaxing at home)? As the primary source of your message, speak from a voice that aligns with your [client’s] brand identity. Too often, marketers seek to impersonate other groups in hopes the message will connect with its audience such as in the case of Ashton Kutcher's controversial Pop Chips commercial or this year’s Volkswagen Super Bowl ad. This risky technique exposes the brand to appearing culturally insensitive and alienates potential supporters. Use clear, unbiased language that allows your audience to internalize your message without reservation. Lisa Crocco, PRSSA Vice President is also the Secretary of Public Relations for the Student Government Association on campus. She is currently running for the Executive Director of SGA for the 2013-2014 school year. How did you become involved with the Student Government Association (SGA)? During a PRSSA Chapter meeting, member Allyson Corona made an announcement that the Student Government Association was taking applications for the position of secretary of public relations. Allyson originally held the position but quickly moved up to being the executive director. It seemed like a wonderful opportunity to get experience with my two majors: public relations and political science. I applied, was interviewed and accepted the position. Why are you choosing to run for executive director? The second I joined SGA I fell in love with it. To be a part of a student-run organization that represents over 21,000 Illinois State University students is incredible. Hearing students’ needs, representing their interests and enacting policies that make their lives at ISU easier and more enjoyable is fulfilling. I knew I wanted to continue my involvement with SGA next year and thought holding a higher position would allow me to work more closely with students. The executive director oversees all the secretaries, plans all transitions and retreats, office upkeep, payroll and focuses on SGA’s image starting internally. What experiences and leadership skills will you take from PRSSA to help you if you are elected executive director? With my current role as PRSSA vice president, I have learned how to effectively lead a large group of people. As vice president I have been responsible for contacting, organizing and overseeing all speakers, workshops and panel discussions. This will be a useful experience and skill to have if I become elected as executive director, since most of my duties will require me to be the key communicator between internal and external members of SGA and ISU. What are some ideas you would like to implement if you are elected? One idea I have for the executive director position that I would like to implement would be hosting more socials with all SGA members. PRSSA has been a wonderful example of the positive effects of having more socials and putting emphasis on making sure everyone knows one another on a personal, as well as professional level. People are more likely to enjoy what they are doing if they have positive experiences with the other members involved within the organization. What are you and your teams’ goals if you are elected? The ticket I am running on with presidential candidate Ben Adams, and vice presidential candidate, Jesse Shapiro, has three main pillars we are focusing on if elected. Those pillars are spirit, strength and service. Through the first pillar of spirit we want to capture, preserve and expand what it truly means to be a Redbird. Through strength we plan to ensure fiscal responsibility for student fee dollars. Through our third pillar of service, this administration will carry out its civic duty to focus on the needs and desires of the students. 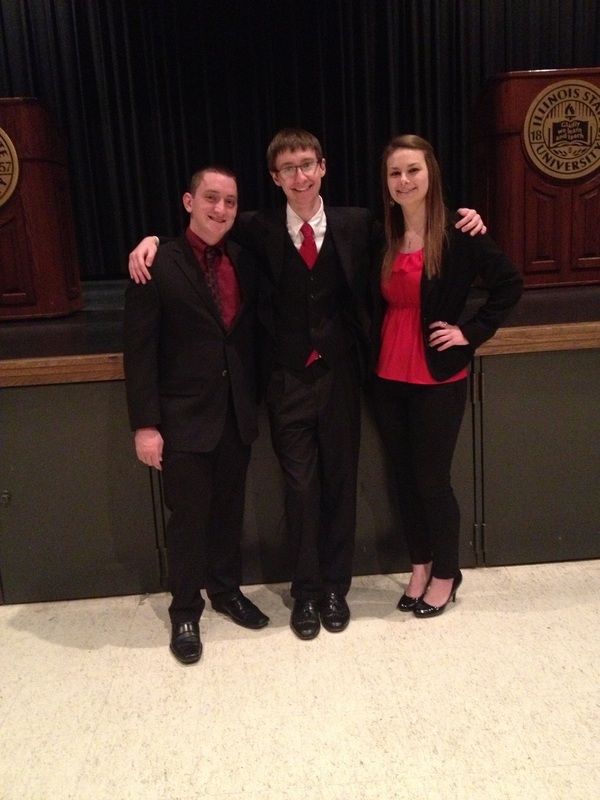 Lisa and her running mates after the ISU presidential debate. SGA members getting ready for Club Milner during fall finals week. The Jewish culture celebrates the holiday of Passover, which began at sunset on Monday, March 25. The holiday lasts for eight days internationally and seven in Israel. The extra day everywhere else is to recognize those who could not be in the Holy Land to celebrate with family, friends and ancestors who fought for the Jews to be alive today. Israel is consistently at war and to become a citizen of the nation, 17 to 19-year-olds just out of high school fight for the Israeli Defense Force or IDF for two to three years, aside from those who stay longer or who are drafted during times of need. Those who are not with their families have to miss the holiday of Passover, whether the soldier is from Israel, the United States or any other country. The IDF spokesperson who controls the official account of the IDF sent out a tweet on Thursday, March 21 to those interested in sending Passover messages to soldiers. “Want to say Happy Passover to an IDF soldier? 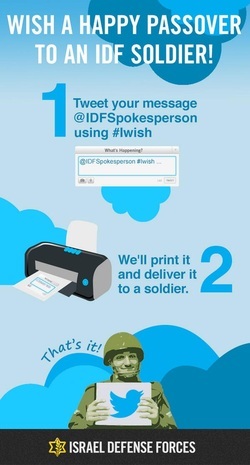 Reply to @IDFSpokesperson w/ your message, use #Iwish, & we’ll send it!” Following this tweet was a link to the photo of how the process works. The PR strategy here is simple, yet hard-hitting and timely. Any person in the world can send a message to a soldier fighting for the people of Israel simply using Twitter. While being able to appreciate these fighters at any time of the year is crucial, it is wonderful knowing these men and women get recognized during the holidays when they should be with friends and family. This message was sent to all the followers, which is over 211,000 and was retweeted by 114 and favorited by 40. All anyone has to do is send a tweet to the account with a specific hashtag, say any message they wish and the rest is taken care of. Many places send Christmas stockings to soldiers during the winter holidays, but this is a message that can be created within seconds and will serve a similar emotional purpose as sending holiday goodies. Not much time is needed, just some love in a message. Major props to the IDF team for marketing themselves in such an effective way. Happy Passover to all those in the IDF and around the world! Keep strategizing! For more information, visit the official IDF Twitter page at twitter.com/IDFSpokesperson. JoeyLauren Jiracek, sophomore PRSSA member, recently took part in The Pay It Forward Tour for Students Today Leaders Forever (STLF). The Pay It Forward Tour gives students the opportunity to tour seven cities across the United States while taking on volunteer projects in each one during spring break. 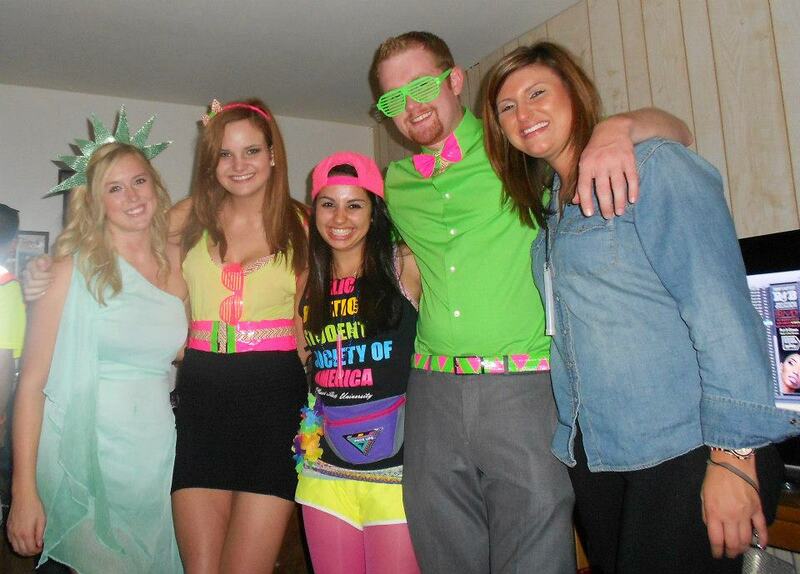 Why did you choose to do an alternative spring break rather than a traditional spring break? I wanted to go on the Pay It Forward Tour because I was looking for a new experience. Since I don’t travel that often, I was excited about being able to road trip through numerous states. I really decided to pursue an alternative spring Break because I love to help people, and I figured this was the perfect opportunity to make an impact in someone else’s life. What was the most important lessoned you learned while on the Pay It Forward Tour? An important lesson I took away from the tour was to really appreciate my life and to never take anyone or anything in my life for granted. Just going around, meeting strangers and hearing their stories opened my eyes to a whole other world. When we stopped by an orphanage, my heart ached for the children who were abandoned by their parents. When we cleaned tornado debris in Alabama, I thought of the families whose homes were demolished. I thought about my own life and how blessed I was to have a loving family and roof over my head. The tour allowed for me to be thankful in so many ways. What was your favorite stop or memory during the Pay It Forward Tour? My favorite stop was in Houston, Texas. We went to a place called Special Cheers, which is a farm that specializes in helping children with disabilities through occupational therapy and horse therapy. We saw a lot of animals and some of us went on trail rides or played games with the children. For our project, our group stained the entire main deck in three hours. It was so rewarding to see the smiles on the faces of the crew who worked there. Since they have a small staff, you could tell they really appreciated the extra help. Houston Fox News even came out to cover the story! 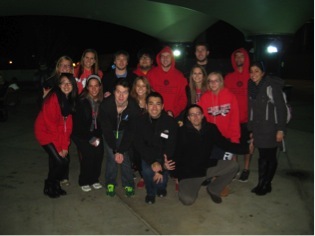 What leadership skills did you learn during the Pay It forward Tour and how will you use them in PRSSA? Out of all the leadership skills I developed on the trip, I think learning how to efficiently work in a small group was the most beneficial. When we arrived at our service project, we would divide up and tackle different tasks. We would have to figure out who would do which job depending on their strengths. It was important that we did this because we only had a short amount of time at each city. I thought we all did a really good job considering we started as strangers that had to be quickly formed into a team. Would you recommend this opportunity to other students? Absolutely! It was the best decision of my life. Every single person comes back with a positive experience. Besides feeling awesome about paying it forward to other communities, you get to meet a lot of new people and develop meaningful relationships. 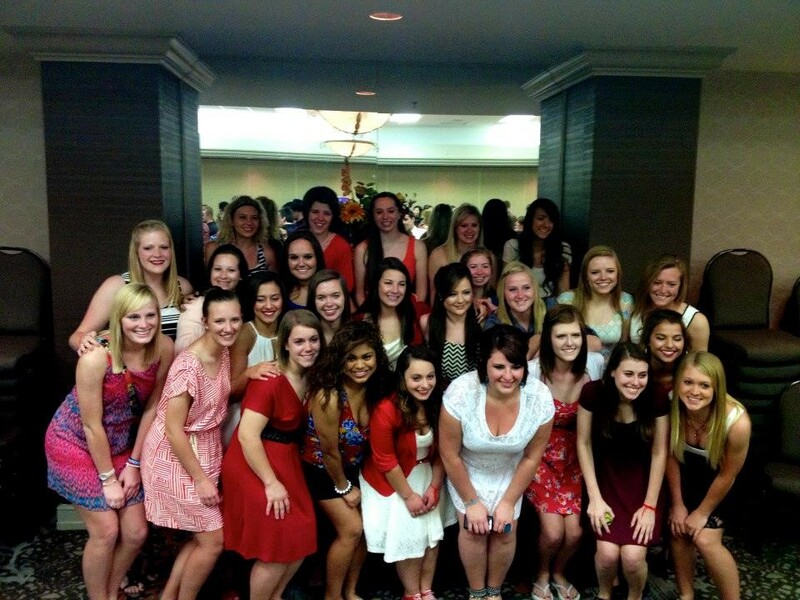 It’s amazing how 43 strangers can become such close friends in the course of a week. I don’t think I ever stopped smiling or laughing once on my trip. The group of people create a great environment to be around. I am planning on going back next year and hopefully even leading a Pay It Forward Tour one day! 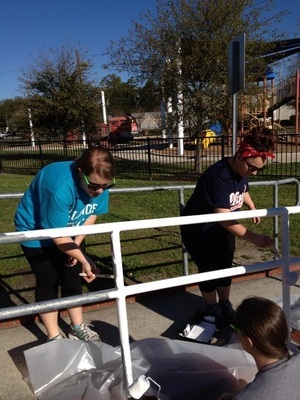 Lake Charles, Louisiana- A friend and I painting park railings, making everything look fresh for the summer. 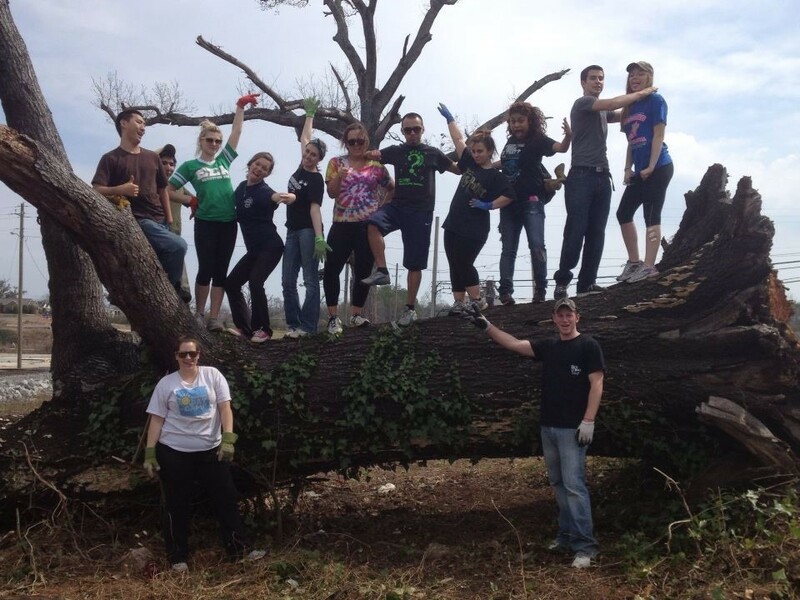 Tuscaloosa, Alabama- We cleaned up debris from a 2011 tornado that uprooted massive trees. Nashville, Tennessee- We took over Broadway Street and helped local students with a “free hugs” social experiment. 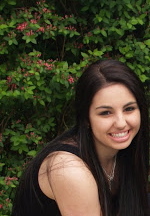 Jennifer Novoseletsky, senior PRSSA member is a supplement editor at the ISU school newspaper, The Vidette. Did you start out at The Vidette as an editor? I started off as a staff writer for the news section of The Vidette. My responsibilities included pitching story ideas and reporting weekly. I then moved up to reporter status and following that is senior staff writer, which is my current position. 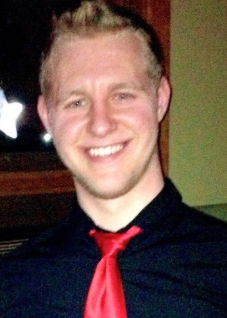 Why did you want to become involved with The Vidette? My major is journalism and I figured what better way to do what I love than by working with it? Funny enough, I was intimidated about applying to The Vidette and I was struggling to find a job around the “BloNo” area. One of my friends from middle school was a photographer at The Vidette and encouraged me to try it since everyone always said writing was one of my strengths. The worst they could have done was not hire me, but I passed the interview and started work the following week! 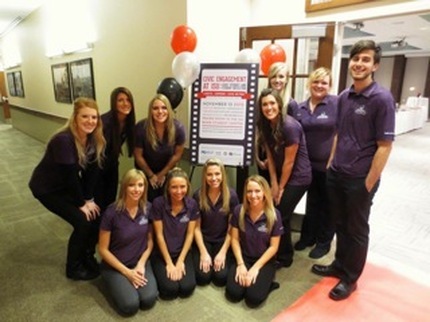 What specific ideas have come from The Vidette to help with the development of PRSSA? 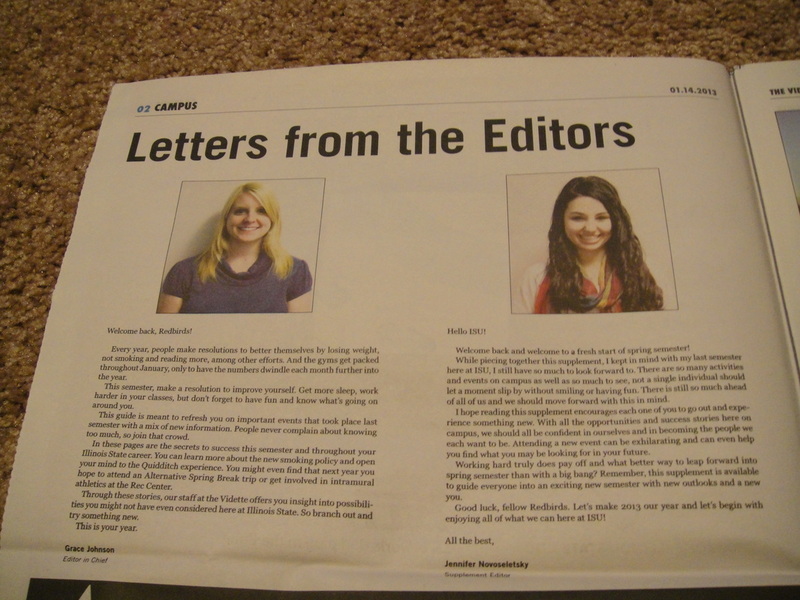 The Vidette and PRSSA go hand-in-hand conveniently. The Vidette has benefitted me in AP Style skills more so than anything else. AP Style is most commonly utilized within the journalism and public relations field and getting my feet wet with this writing style at the newspaper has helped me significantly within PRSSA. I can comfortably edit newsletter articles and blog posts for the organization because of my experience through The Vidette. What skills have you gained from being an editor at the Vidette that will help you in your future career? I am a supplement editor, which means putting together little newspapers or magazines, all relating to one theme, tucked into The Vidette. This position has helped me practice my skills within InDesign, editing within AP Style and it made me really think to organize and gather ideas of what kinds of articles to assign to other reporters. All of these skills have definitely helped learn about the communication industry and prepare me for my future. What has been your favorite memory since you started with the Vidette? Everything about The Vidette just makes me smile. This semester is especially one of the best for me because I am currently a senior staff writer, an editor and an intern. As an editor, I have gotten to know other editors better than I would have as only a writer. Additionally, as an intern, I get to attend Student Government Association (SGA) and Academic Senate meetings and feel like I truly get the inside scoop on what is going on around campus. I honestly have to say working with the Vidette on a daily basis is absolutely memorable. I get to meet different people and explore different horizons within ISU. 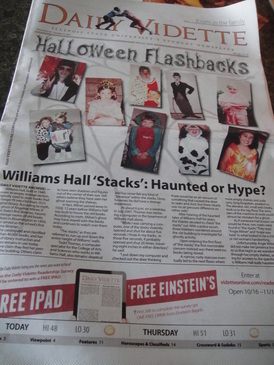 Jennifer was featured in the bottom right photo with several other Vidette employees for the Halloween issue. 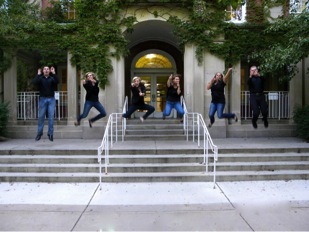 The Vidette family photo for the 2012-2013 school year. Letter from the Editor written by Jennifer. Crises, especially those centered around social media, are almost always detrimental to companies and affect reputations in a very negative way. Recently however, many companies have been finding ways to actually use crises to turn things around and portray themselves in a positive light. Most are doing this through social media sites such as Twitter. One of the first examples of this was the Red Cross. In 2011, the Red Cross had a “rogue tweet” sent out from their account that read, “Ryan found two more 4 bottle packs of Dogfish Head’s Midas Touch beer….when we drink we do it right #gettngslizzerd.” The original tweet was sent out at 11:24 p.m. on Tuesday, Feb. 15. The social media team for the organization acted quickly tweeting, “We’ve deleted the rogue tweet but rest assured the Red Cross is sober and we’ve confiscated the keys,” just an hour later. Dogfish Head, a craft beer company who was amused by the original tweet, actually went as far as to create a string of tweets using the hashtag, “#gettngslizzerd” with messages about donating to the Red Cross. Soon after, the Red Cross sent out a tweet thanking Dogfish Head for their support, as well as posting on their blog. They spoke of how they were thankful people helped turn their, “social media mistake” into a good thing. Another example of brands turning a crisis into a good thing is the Super Bowl blackout. Although this was a disaster for the NFL and for many of the fans in attendance at the Super Bowl, brands took to Twitter to promote their name. Buffalo Wild Wings was a brand that contributed a funny tweet to make light of the situation. The restaurant has several commercials featuring workers pushing special buttons to delay the game because their customers are not ready to leave yet. Before the company sent out an official tweet, many people were saying things like “this seems like a Buffalo Wild Wings commercial.” Buffalo Wild Wings responded to this by tweeting “We just really don’t want football season to end. Can you blame us?” The company’s CEO credits this tweet for bringing them extra business this year. Most recently, there have been Twitter hackings. The Burger King Twitter account was the first to be targeted. Hackers changed the main picture to the McDonalds logo and claimed, “We just got sold to McDonalds.” The hackers also posted many tweets, most were either taking stabs at Burger King’s food or were blatantly racist. Jeep’s twitter account was also hacked, posting similar inappropriate tweets, and making the profile picture the Cadillac logo. While this was a disaster for both Burger King and Jeep, some other companies used it to promote themselves. McDonalds tweeted “We empathize with our Burger King counterparts. Rest assured, we had nothing to do with the hacking.” Wendy’s also chimed in tweeting, “We have an alibi.” While this was a crisis for Burger King at the time, many people understood that it was not them tweeting and the company ended up gaining followers because of the situation. What all of these events have in common is the use of humor and humility. None of the companies were afraid to address the situation and all used light humor to show their fun side as well. These events make companies more relatable to their consumers since they no longer perceive companies as a faceless brand, but are able to see the more “human” side of them. Masa Sun, senior PRSSA member is one of the founders of the only skateboarding RSO on Illinois State University's campus, Skate Ilstu. Why was Skate Ilstu started? We decided to start Skate Ilstu because we wanted to meet more people who we could skateboard with while we were at school. Skating is more enjoyable with other people, and before the club, we found ourselves not having many people to call to go skate with. It’s a funny story how it started actually. I started Skate Ilstu with my best friend Steve, after he transferred to ISU during sophomore year. We had grown up skating together back at home, so we would get together with a few other friends to skate whenever we could. The idea of a skate club would occasionally bounce around between us, but we had our doubts about it. This was also during the time when I had the most stressful time deciding on a major, so I would frequently meet up with career advisor, Mark Fauble for help. After agreeing that a communication studies major was suitable for my interests, he then explained to me about how important it is to get involved. It was then that I decided I would check out PRSSA for my major and also talk to Steve about following through on the RSO idea. Mark has been Skate Ilstu’s faculty advisor ever since, and we all couldn’t agree more about how awesome this journey has been! How have you incorporated your skills from PRSSA into growing and developing Skate Ilstu? So many things I’ve learned from PRSSA have helped me with Skate Ilstu, such networking and communicating with members, the use of social media and event planning. Has Skate Ilstu recently won any awards, if so what are they? I don’t believe we have one any physical awards, but I constantly witness progression from everyone. To us, the constant progression of expanding our skills and overcoming fears are the most valuable awards. We work as a family to motivate each other to skate our best. What position do you hold in Skate Ilstu and what are your responsibilities? I am currently the president, serving my last term until this semester ends. My responsibilities include event planning, gathering members together to skate and coming up with new ideas to improve the organization. 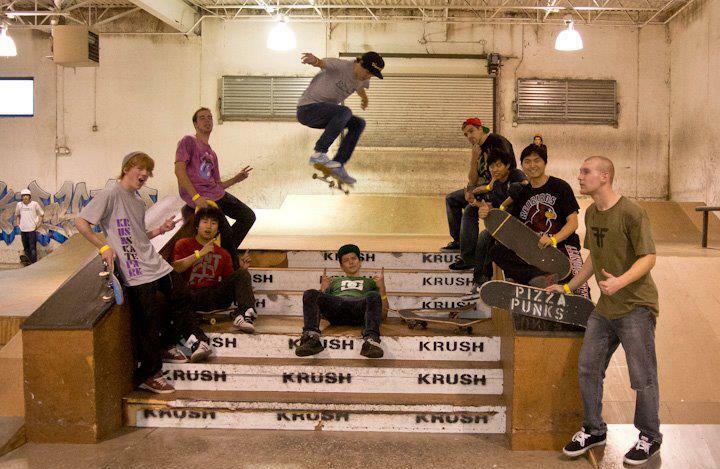 What is your ultimate mission for Skate Ilstu? Our mission is to become a more closely knit community where anyone who skates or is interested in skating can feel welcome and is excited to be a part of Skate Ilstu. Before I graduate, I want to lay a solid foundation and structure so that all student skateboarders can continue to make new friends and motivate each other to keep skating, have fun and progress during their years at Illinois State University. 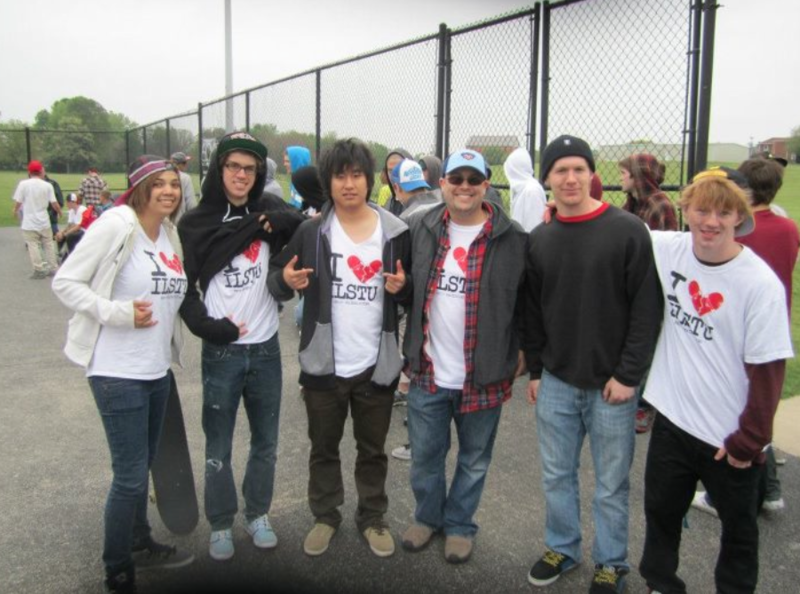 You can learn more about Skate Ilstu by liking its Facebook page or joining its Facebook Group. Masa performing a "hard flip". 1. What made you want to be a part of executive board and why did you choose to apply for treasurer? I really wanted to become a part of the executive board because I thought that it would be a great leadership experience. I also wanted to give future members as good of an experience as I had my first year in PRSSA. Also, I chose the position of treasurer because I have a lot of experience with budgeting money and I wanted to be able to figure out ways to let us give back to the Chapter. 2. 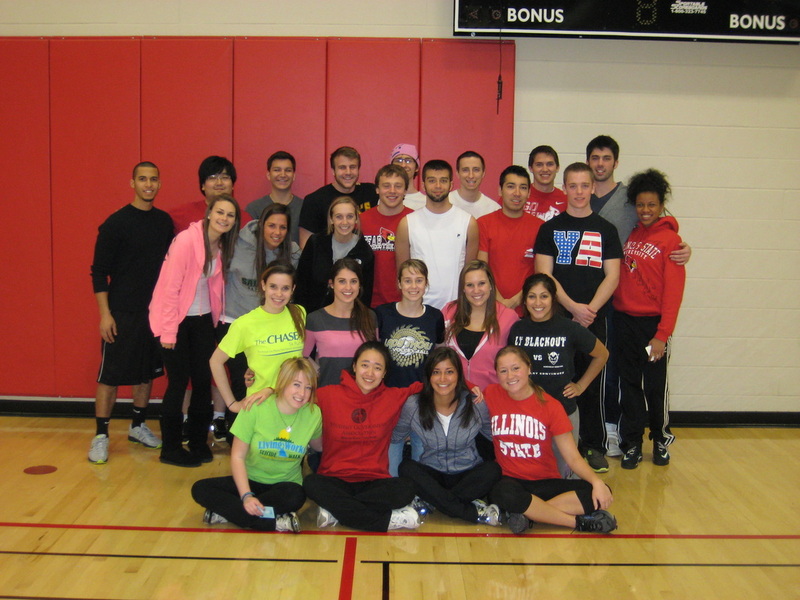 What is your favorite class at Illinois State University? My favorite class as ISU so far has been COM 227, Organizational and Professional Speaking. So far we have practiced giving pitches, learning about social media, resumes and cover letters. Everything that we have done is something that will be incredibly beneficial to me in the future so I enjoy learning about it. 3. Since you are a mentor, who do you turn to when you need guidance or advice? Even though I am a mentor that doesn't mean that I don’t need help sometimes myself. Luckily, since I'm actively involved I have met a ton of people that are always there for me. I have my fellow executive board members or School of Communication Promotions and Development interns to turn to when I need help whether it is with a project or a class assignment. Also, both my sister and my boyfriend attend ISU so whenever I just need to vent or am overwhelmed they pull me back to reality and remind me that things are never as bad as they seem. 4. What do you love most about Bloomington/Normal? I love Bloomington-Normal because of the atmosphere. I come from “small town U.S.A.” and my town has only 3,500 residents, which is quite different than the number in Bloomington-Normal. I love my small hometown and miss it a lot, which is largely why I chose ISU. Illinois State is only about an hour from my house and even though this town is much bigger than my hometown, when I'm walking through uptown Normal or on ISU's quad I still get that small town atmosphere that I have when I'm at home. I love the small town feel on a big school campus. If I could be anything, I would want to be some kind of rock star. Even though I have absolutely zero singing ability and my dance moves probably remind people of watching their parents dance, I think it'd be so awesome to go on stage night after night and perform for a group of people or sold out crowds. 6. How do you balance homework, PRSSA, internships, social life and any other time consuming activities? Sleep! I know that seems like the total opposite answer than what I should say but it's true. I need to get a good amount of sleep every single night. If I sleep well during the night, I feel totally energized and ready to go, go, go all day the next day. Also, my calendar is my lifesaver. I write down every single assignment, social, event or anything else I have to do or be at the second I find out. If it wasn't for my planner I would probably go crazy. It's all about time management and knowing what you can do at what times and how much time everything will take. Also, I have awesome friends and a boyfriend that are understanding of my crazy schedule. They aren’t mad if I can't go out on weekends because I have to work or catch up on homework. They are also forgiving of me if I’m absent for things I wish I could be at. I'd be lost without them! 7. Where is your favorite place to eat in Bloomington/Normal? My favorite place to eat in Bloomington-Normal isn't anything snazzy, it's actually the Pub 2. I love being able to grab easy meals like a burger and cheese fries (my favorite food - yum!) and kick back and relax with my friends in a really chill atmosphere. I love that most of the customers are college students so I feel really comfortable there. Plus, they have a dartboard. What could be better than that? 8. If you could travel or vacation anywhere, where would you go? Right now, if I could travel anywhere I would go to Greece. I'm a total beach bum at heart. There is nothing I love more than hanging out in the sun on the beach with an ocean in front of me, which Greece has. However, the country also has an incredibly rich culture with beautiful buildings to see and places to tour, which I also love to do. Greece would be the best of both worlds. 9. Do you have any advice to give to future or current members of PRSSA? Don't be afraid to dive in and get involved! I transferred as an English education major and ended up joining PRSSA. I applied for the Director of PRi position and accepted the position before I was even a communication major yet. Last year's e-board told me they selected me because of my energy and willingness to learn. That changed my whole life. I changed my major from English Education to communication studies and the rest is history. You really don't know how far you can go or how much you can push yourself until you just try! 10. Looking back at your time through PRSSA, what were the most challenging and the most rewarding situations? My most challenging situation and most rewarding situation in PRSSA are probably the same, if that makes any sense. This year I really wanted to create a Chapter budget and be able to use some of the Chapter’s money in order to give back to our members. I spent hours and hours looking over previous year’s income and then spent even more time creating a potential budget for this year. It was a lot of hard work and a lot of list making that I wasn't required to do but I did it because I wanted to. I brought the budget to Dr. Smudde and he was so impressed, which made me feel elated. We ended up being able to spend some of the Chapter’s money for various activities such as National Conference, a networking dinner and our Chapter socials. It felt really rewarding to know that we were helping out the entire Chapter. 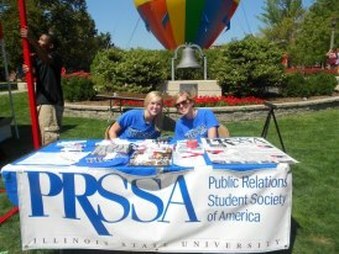 Working the PRSSA table with President Kaitie Ries at Festival ISU this past fall! Helping out by stocking stuffing for operation santa! Historian Kim Nowlan and I at State Farm during our corporate communication tour train this year. 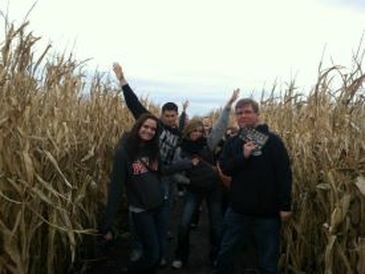 Members being silly at the corn maize/haunted house social this past fall! 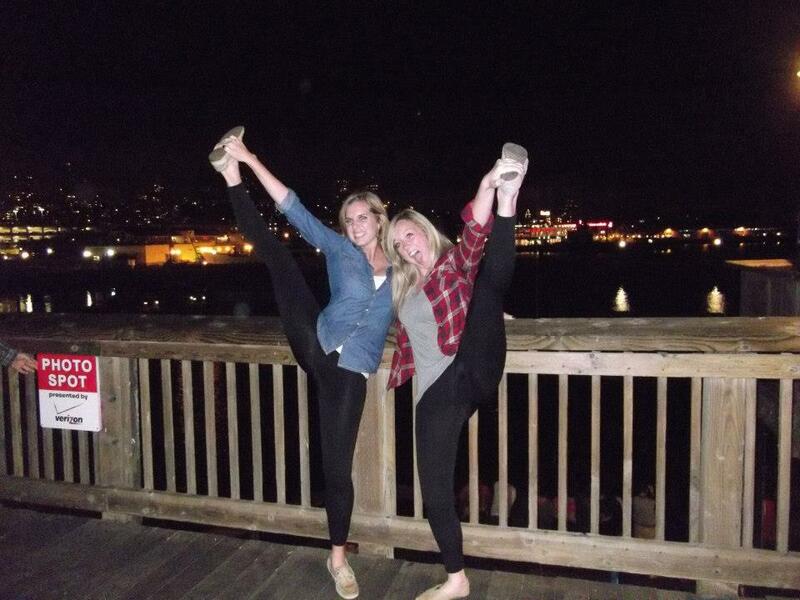 President Kaitie Ries and I having fun cheering on the San Francisco pier! 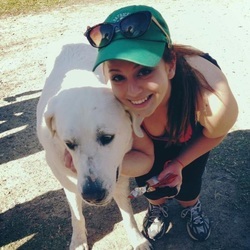 Kelsey Nevius, senior PRSSA member recently planned the Epsilon Sigma Alpha Polar Plunge. Epsilon Sigma Alpha is an Illinois State University service and leadership organization that works to serve the community and several philanthropies. Why did you choose to raise money for Polar Plunge instead of another non-profit? 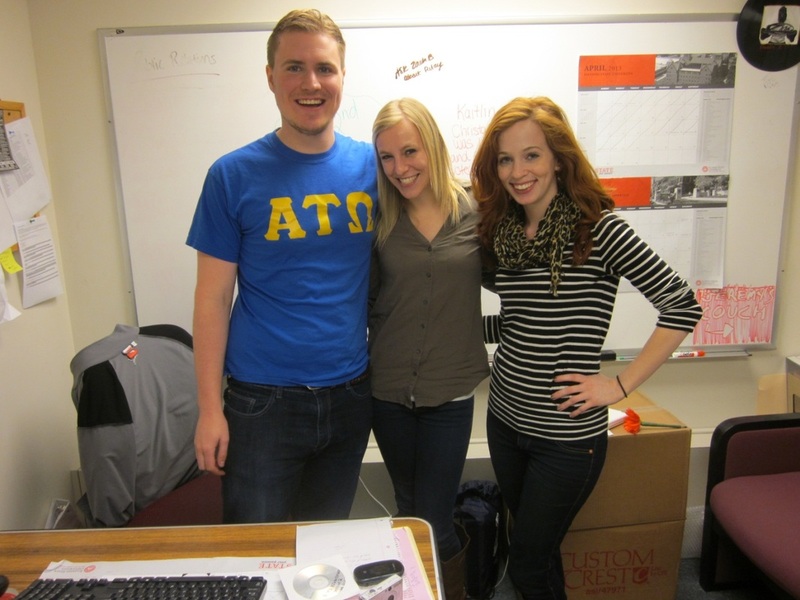 Epsilon Sigma Alpha (ESA) participates in different events that go on in the Bloomington-Normal community. The Polar Plunge is popular in our chapter because it is so different from any other fundraiser. It’s not every day that you can run into a frozen lake for charity. It is definitely an experience! 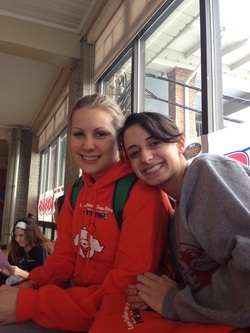 This was the third year for ESA to plunge and we raised over $4,000 for the Special Olympics. 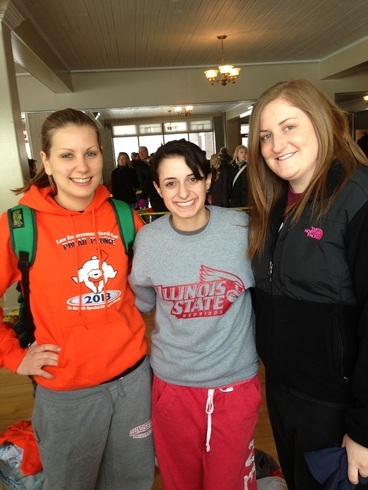 What position do you have in Epsilon Sigma Alpha that allowed you to plan the Polar Plunge? I am one of three Junior Philanthropic Chairs. What are some of your responsibilities that come along with this position? The three of us work together to coordinate different events that take place in the community. Some examples of the events we have participated and volunteered for this year include the Walk to End Alzheimer’s, ISU Alumni Window Painting, Glenn Elementary School Carnival, hosted a blood drive and adopted two families to give presents to for Christmas. We are also planning to participate in Relay for Life and the March of Dime’s March for Babies event. What steps did you take to register your RSO for Polar Plunge? Registering for the Polar Plunge was actually really simple. They have a website through First Giving and one of the other girls I work with created a team for ESA. The girls that participated joined our team and were required by the Special Olympics to raise a minimum of $75 in order to plunge. What was your favorite part of Polar Plunge? 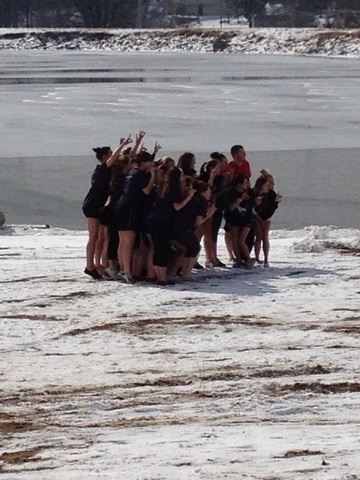 My favorite part of the Polar Plunge was watching all of the girls that I ran into the water with. A lot of anticipation builds up when you are standing outside in 20 degree weather in shorts and a t-shirt waiting to run into a frozen lake. Once all of us were in the water there was a lot of girly screaming, laughter and tears! It was so fun and absolutely miserable at the same time. I am happy I did it! All 35 ESA plungers waiting to be called for the event. All of the ESA members getting pumped to go plunge. Kelsey Nevius along with two other PRSSA members, Tammy Olson and Becky Oraham waiting for the event to start. 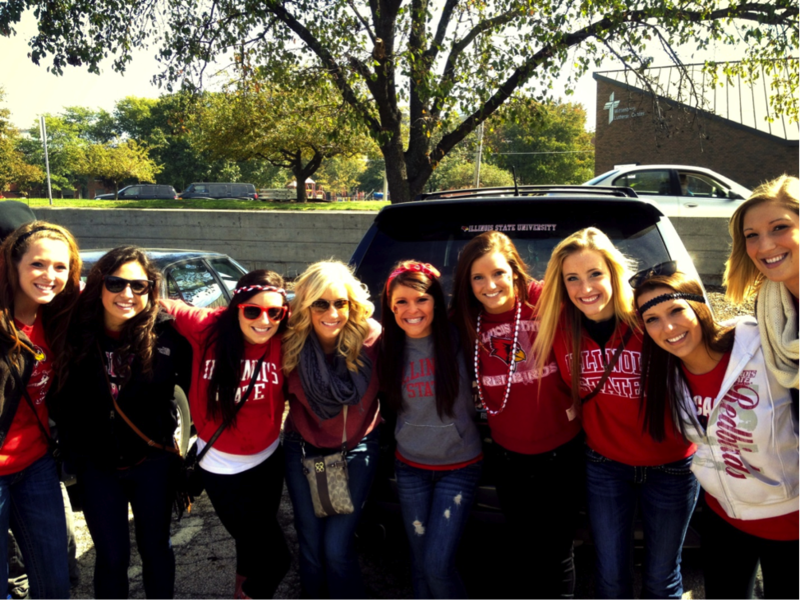 What are you going to miss the most about ISU after you graduate? Since I transferred to Illinois State as a junior, I didn’t know that many people so I was very focused on my classes and getting my degree. The people I became the closest with were those around me in my public relations classes and in PRSSA so I will definitely miss not seeing them in Fell Hall all the time. There have been many comical as well as serious moments that took place inside that building. What is your dream job for after graduation? To be completely honest, growing up I was banking on being a professional motocross racer. As most of you know, that did not happen (laughs) and I came to ISU to study PR. I have been fortunate enough to be able to work with a professional motocross team for the past nine months and I absolutely love it. While working in a body shop through high school, I developed a passion for the automotive industry as well, so I’m thrilled to start at General Motors upon graduation. To put a finger on an exact dream job would be hard because I have too many at this point. To answer the question though, I hope to one day run a successful company and influence the industries I am passionate about. What was the inspiration behind starting your two businesses? VOID Clothing: Growing up, I was very passionate about every extreme sport out there. I did it all including motocross, inline skating, BMX, skateboarding, snowboarding and wakeboarding. Around this time, my family went through a financial crisis and things were obviously pretty tough. If it wasn’t for my relationship with the Lord and my passion for extreme sports, I don’t know if I would still be here today. My previous partner also had a similar story and attributed extreme sports to being there when nothing else was. When we decided on the name VOID Clothing, the slogan of “Fill the VOID” was quickly born. I want everyone who wears VOID Clothing to feel as if they are a part of something if there is nothing else for them in life. Slamans PRoductions: This story behind this business is nowhere near as an emotional story as VOID is. After launching the clothing line, a couple of family friends asked me to help them with some social media branding for their businesses. From assisting those two businesses, I had seven other people contact me wanting to do similar work, one of which was the professional motocross team. Knowing that I would be representing a professional motocross team in front of Fortune 500 companies motivated me to fully establish SlamansPR. What advice would you give to future/incoming ISU PRSSA members? #1- Don’t be afraid to take chances and follow your dreams. #2- Get involved in ISU PRSSA. 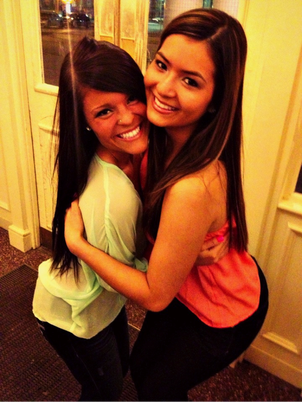 #3- Pick the brains of professors and upperclassmen on a constant basis. There are so many great opportunities for members in our Chapter, so take the leap of faith, and watch as you flourish. I have two that I will remember forever. The first one was 2012 PRSSA National Conference in San Francisco, Calif. Presenting a Chapter Development Session as an executive board was an amazing experience. In addition, the support we received from the members that attended from our Chapter was overwhelming. The other memory is a random day when I was walking across the bridge to Fell Hall. 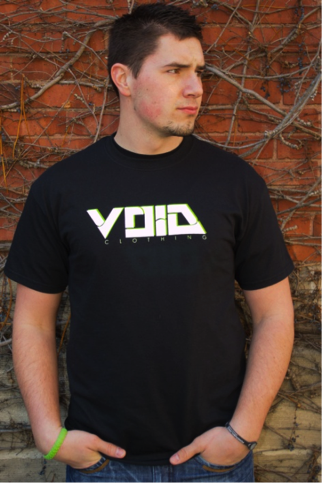 A student stopped me and asked where I purchased the VOID Clothing shirt I was wearing so I told him to check out the website. He said the shirts were sweet and that he had to get some since he had been seeing a lot of people on campus wearing one. Knowing people were recognizing the brand meant a lot to me. What PR class has been your favorite? Even though COM 178, Introduction to Public Relations, with Mr. Tom Lamonica was a great intro to the major as a student as well as a teaching assistant, COM 377, Public Relations Campaigns, with Dr. Rebecca Hayes was by far the best class yet. 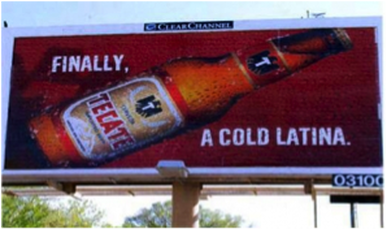 Being able to build a campaign and pitch it to our client was a great experience. The fact that our agency’s campaign was chosen as the winner by our client was also really rewarding. Are you in any other clubs or organizations on campus? Since I work for four different companies I do not really have that much free time. 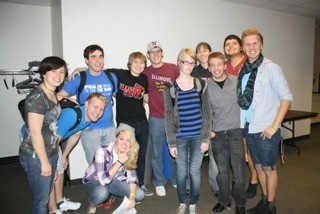 ISU PRSSA obviously is the best RSO on campus so I would not want to join another and be disappointed! Who is the biggest role model in your life right now? That is a tough question because I try to model my life after a few people, but I’d say my biggest role model is Ken Rogers. He is the owner of KB Collision, a body shop where I worked for four years. I still go in on occasion to help out when I’m home. I have told him multiple times that he is like my second father. Even though I do not talk to him on a daily basis anymore, I still call him weekly to catch up and ask him for advice on anything and everything in life. If you had the chance to have dinner with one celebrity, who would it be and why? I have been asked this many times and I will still say the same guy, the king of supercross, also known as Jeremy McGrath. I grew up watching him on TV in my father’s arms at the age of two, and I loved how he assisted in bringing the sport to what it is today. The photo shoot we did at ISU before launching VOID Clothing. 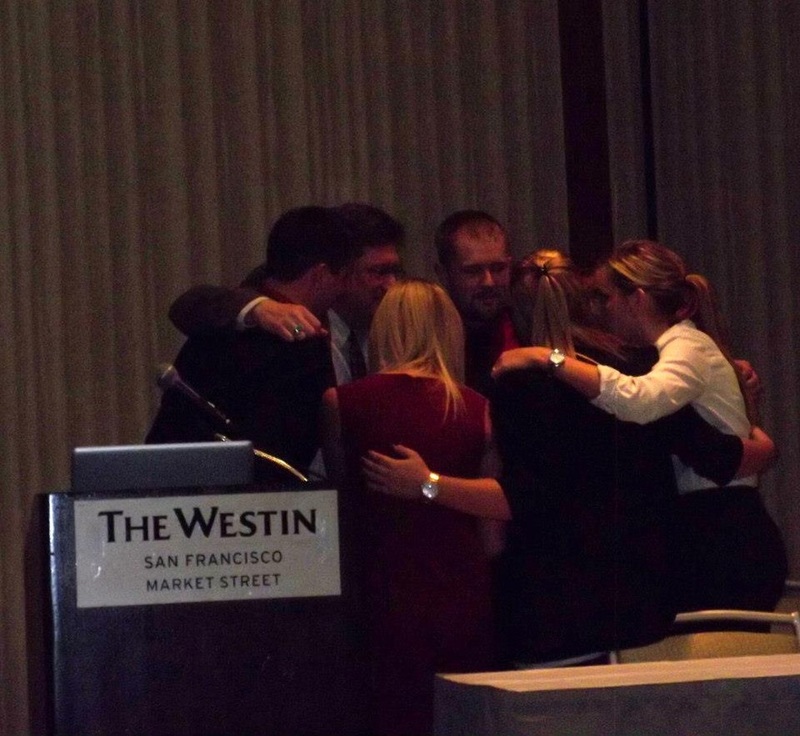 Our special huddle moment as an e-board with Dr. Smudde before we presented at PRSSA National Conference. 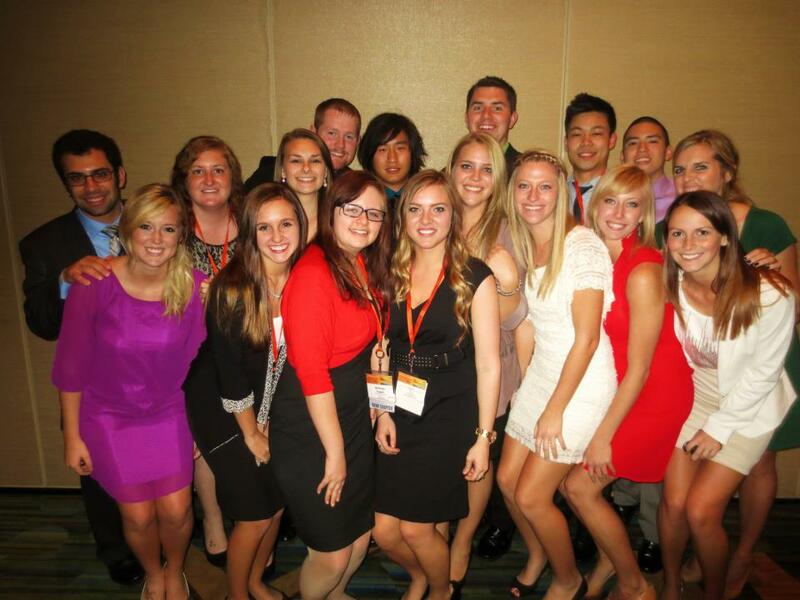 I had a blast with this group of members that attended PRSSA National Conference! The best e-board to work with. The thought of trying to land an internship or your first professional job can be both intimidating and frightening. Google is one of the first places people look for information on what to include on a résumé, how to prepare for an interview and what to showcase in a portfolio, but there are many different opinions on what the “right” thing to do is. In Chapter, we were lucky enough to have a panel of professionals give us advice using their personal experiences on tips to enhance our résumé, interview approach and portfolio. 1. If your grade point average is low, do not include it if your résumé is submitted online, only if submitted in person at a job fair. You want to be able to have a conversation about your GPA and explain your circumstances. 2. If you have an online portfolio, LinkedIn account or online résumé, include the information in your contact information. 3. Your work experience should not just list what you have done but what you have achieved in those roles. Use numerical measurements, like media mentions, impressions, etc., whenever possible. 1. During a phone interview, make sure to keep up your enthusiasm and energy since interviewers do not have the non-verbal feedback that you would get from a traditional interview. You should even dress the part so you feel professional and confident! 2. If you have a panel interview, stay calm. Acknowledge the person asking the question, but do not forget to make eye contact with the other interviewers as well. 3. Keep a list of common interview questions and write down answers for each so you can practice for future interviews. However, make sure the stories sound genuine; do not memorize them. 1. Using class work inside your portfolio is acceptable until you have enough real world examples. Typically by the time you are a junior or senior you should be able to show some work you completed outside of class. 2. Include the original work you created (ex: a press release you wrote), but also include any media coverage that may have generated as a result. This shows that your work was successful. Also add impression numbers if you have them. 3. Leave behind some of your best work with the interviewer. You most likely won’t have time during your interview to show all of your work. Each professional that spoke left our Chapter members with many different tips to apply when they are preparing for their next internship or job. Learning from these professionals definitely made our Chapter members better candidates upon graduation. On Tuesday, Feb. 5, our PRSSA Chapter had the pleasure of hearing Enterprise Rent-A-Car Talent Acquisition Specialist Mary Kate Garner speak about her experiences as a job recruiter. Enterprise is the largest car rental service in the United States. The corporation also provides "fleet management" which allows third party companies to rent fleet cars from them. 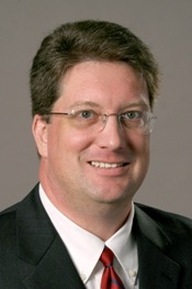 Garner's job includes attending career and internship fairs at various universities since Enterprise only hires individuals with a Bachelor's degree. In fact, last year they hired 11,000 college graduates (hint, hint). What I like about the Enterprise employment process is everyone starts at the same entry level position. When hired, all employees have to attend a nine to12 month management training program. Garner noted that even President Pamela Nicholson did this training. Enterprise also builds opportunities for an employee to advance his/her career. Garner showed us an infographic of where you start and can end up as an Enterprise employee. Since Garner is a job recruiter she also gave us a lot of practical advice for those who are entering the job force. As a graduating senior, her tips helped me understand what recruiters are looking for when hiring. Garner said if you do not know how to begin searching for a job, start at a job and internship fair. Talk to the recruiters about employment opportunities and follow up with them. When you follow up with them, be sure to mention something memorable about your conversation. Recruiters see a lot of graduating students on a regular basis, so you need to make sure you stand out. When you approach recruiters Garner urged us not to say “what do you have to offer me?” Instead, ask about what the company is looking for in an employee. When asked about the “color on resume” debate, Garner said she prefers no color. While that is a personal preference she said, “let the experience speak for itself, not the color or graphic.” Garner also advised us to cater our resume to the specific employer in which you are applying to. I enjoyed hearing Garner speak to our Chapter. She had wonderful insights as to how we can present ourselves to the job world. Whether you are looking for a job or an internship, Garner taught us how to make ourselves marketable in the job world. If you are interested in possible employment opportunities at Enterprise Rent-A-Car, visit www.erac.com/ for more information. Kailey Snider, junior PRSSA member was recently elected as the Illinois State University’s Delta Zeta Lambda Rho Chapter President. Delta Zeta is a sorority with its roots grounded in strong leadership, philanthropy, academics, sisterhood and enriching the lives of others. 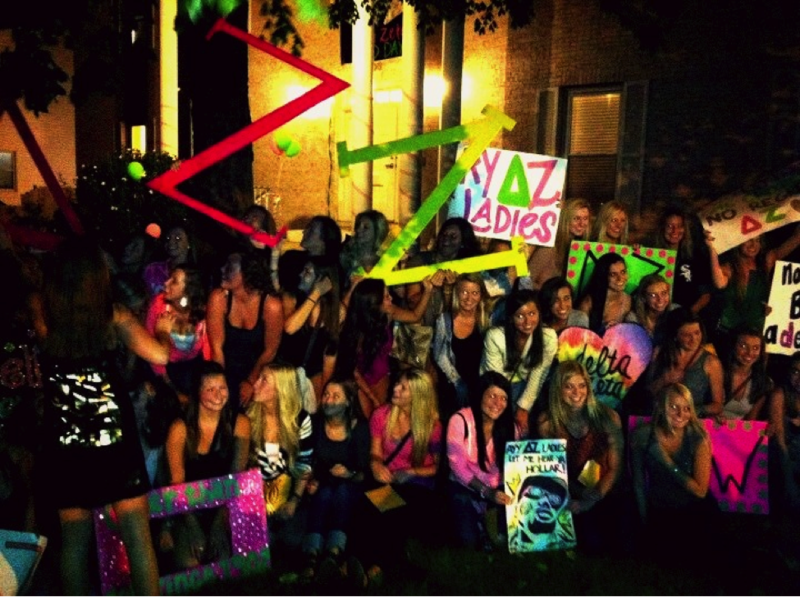 Why did you choose to join Illinois State’s Delta Zeta sorority? Once you were nominated for president of Delta Zeta, what made you accept the nomination? I accepted my nomination for president of Delta Zeta because I am so passionate about our organization. I felt I could build on the solid traditions which have already been established as well as make a difference, take our chapter to places we’ve never been before and continue those everlasting friendships. I love knowing that I can keep such a strong organization and it’s dream alive by bettering the lives of others. Being nominated as a new member and elected by my sisters was such an incredible feeling. There’s no better feeling than knowing you have over a hundred girls who believe in you and trust you to lead their chapter. There was absolutely no way I could pass up such a phenomenal opportunity. It’s really been a blessing. What skills will you bring from PRSSA to help you be a successful president? PRSSA taught me about how important networking and identifying your allies is. With that being said, once I was elected and accepted my position that’s exactly what I began to do. 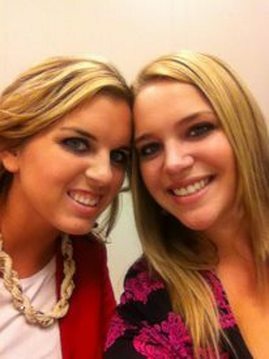 I began to create relationships with other Delta Zeta’s across the country, alumni and other fraternities and sororities on campus. I also identified our Greek Affairs office as our ally. They want to see all sororities and fraternities on campus succeed. They are here to support us and guide us in the right direction. What new ideas are you hoping to implement as president of Delta Zeta? As president of Delta Zeta, I am hoping to raise our overall GPA, begin new philanthropies, increase the number of sisterhood events we partake in and get more involved in our community. I would also like to revamp our New Member and Big and Little programs. My main goal is to get the Delta Zeta Lambda Rho Chapter recognized at a National level and win a Collegiate Chapter Award. What has been your favorite part about being president this far? So far my favorite part of being president has been getting to know all of my sisters and creating those bonds that only we Delta Zetas can understand. Attending Presidents Academy in Dallas, Texas this past weekend has also been a favorite part of my new presidency. I was given the opportunity to meet other Delta Zeta presidents from across the nation and created everlasting friendships. Not only did I get to meet sisters from all over the nation but I also got to learn more about our organization and how we can better our sisters, our chapter and ourselves. Being a part of Delta Zeta is truly a blessing. After reading a compelling post from Ragan News titled “6 PR and social media predictions for 2013,” the fifth point, “Pictures tell the story” was one I thought was worth sharing. With the rise of infographics, photo sharing and Instagram, knowing how to produce a quality, visually-appealing message will be a must in 2013. Simply telling a story will not be enough; public relations professionals will need to know how to convey the message in an image that speaks to their audience. When I finished reading the post, I remembered a beta site named infogr.am that President Kaitie Ries discovered earlier this year. Infogr.am allows you to build your own infographic and encompasses all the essential tools needed to turn data into an eye-catching, creative graphic. The one year anniversary of my company, VOID Clothing, is just around the corner, and I’ve been looking for a way to use Facebook Insights to create a story that showed our demographics over the year. I knew an infographic was the perfect way to tell our story. To see it, click here. One great tool that infogr.am offers is the upload function. When you are creating tables or graphs you can upload the statistics you have right from Excel instead of having to retype it all, a HUGE time saver. Even though we are working in PR, remember that does not mean that we can forget the math we once learned. Math formulas combined with quality research will create statistics and percentages that a professor, boss or client would love to see. You might be wondering why infographics are important in today’s world but it’s simple. People want to read new, creative and interesting messages from the companies they love. Knowing how to create infographics is a skill that will stand out to employers when looking through a sea of resumes. 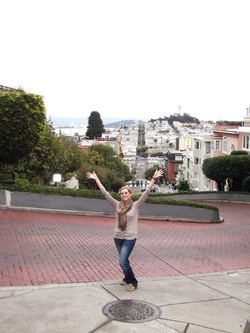 Becca Latham at the 2012 PRSSA National Conference in San Francisco, Calif. This is the first post in a series titled “Member Monday,” designed to recognize members who stand out in our school and community outside of ISU PRSSA. 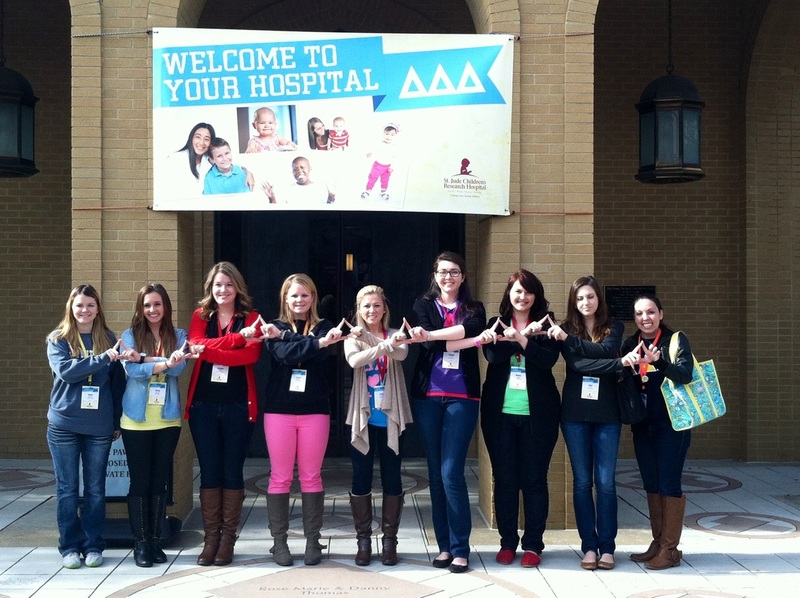 Recently one member, Becca Latham, attended the Tri-Delta Leadership weekend at St. Jude Children’s Research Hospital in Memphis, Tenn. Her sorority, Delta Delta Delta, partners with St. Jude Children’s Research Hospital and hosts many philanthropic events to support the development of the hospital. 1.) Why did you choose to attend the St. Jude leadership weekend? I was chosen by my chapter as next year’s philanthropy chair and all philanthropy chairs attended the leadership conference. I was lucky enough to also attend the conference with our president, Danielle Dorion. 2.) What was your favorite part about the conference? My favorite part was visiting the hospital for the second time. I love seeing how the hospital uses the money we raise. Nationally, Tri Deltas have raised $1 million to name the Teen Room, $10 million to name the Patient Care Floor and are currently working to raise $15 million to name the Specialty Clinic located in the Patient Care Center. Around each of these rooms and throughout the hospital, there are signs of Tri Delta to remind the kids that we support them. It is such a rewarding feeling to walk through the halls and see our Greek letters everywhere. You would think that visiting a hospital is a sad experience, but not at St. Jude. All of the walls are painted with bright colors, the children’s artwork lines the walls and the waiting rooms are filled with games and toys. In addition, the desks are at the children’s height so the reception desk workers are speaking directly to both the parents and their children. One of my favorite things about St. Jude is that the nurses wheel the kids around in wagons instead of wheel chairs. St. Jude has thought of just about everything to help accommodate the kids while they are busy fighting for their lives. 3.) What tools did you bring back from the conference? I gained a lot of tools to help me plan events both for my position as philanthropy chair and in my future career. Phired Up Productions, an education firm, presented at the conference. I learned the importance of working with your chapter and asking others to help with the event if needed. I also learned a lot of small ideas such as strategically reaching out to external resources and organizations. I really enjoyed meeting other philanthropy chairs and exchanging ideas about fundraisers. "Being at the conference revitalized my enthusiasm for helping St. Jude and reminded me how important fundraising for such an amazing organization is." 4.) How do you feel you will be able to use those tools at ISU and in your career? The things I learned at conference will help me plan my fundraising events both this spring and next fall. It will help my future career because one day I hope to work for St. Jude. I would love to be a part of their American Lebanese Syrian Associated Charities (ALSAC) team as a public relations representative. The ALSAC team has been the exclusive fundraising organization of St. Jude Children's Research Hospital since 1957. 5.) Did you sightsee while on the trip? If so, what was your favorite thing that you did? My favorite thing to visit was the hospital. However, we also went to Graceland. It was neat to see the unique furniture and decorations that Elvis had in his house. It was a really cool place to tour and I had a lot of fun with the new friends I made that weekend. Friend Becca on Facebook or follow her on Twitter. If you or a member you know would like to be featured in Member Monday, email Marrison Worthington, blog chair, at meworth@ilstu.edu. 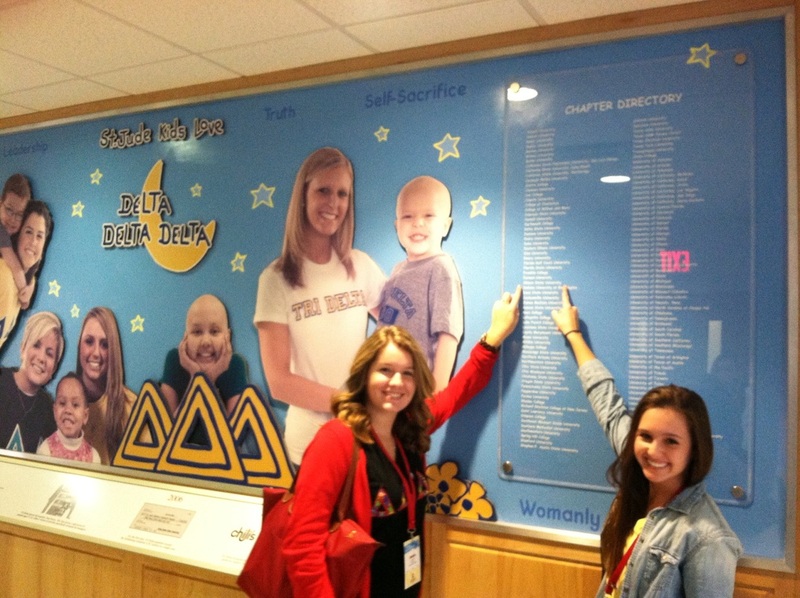 Becca and her chapter president pointing to their chapter name on the Tri Delta floor at St. Jude. Outside of the Danny Thomas pavilion. 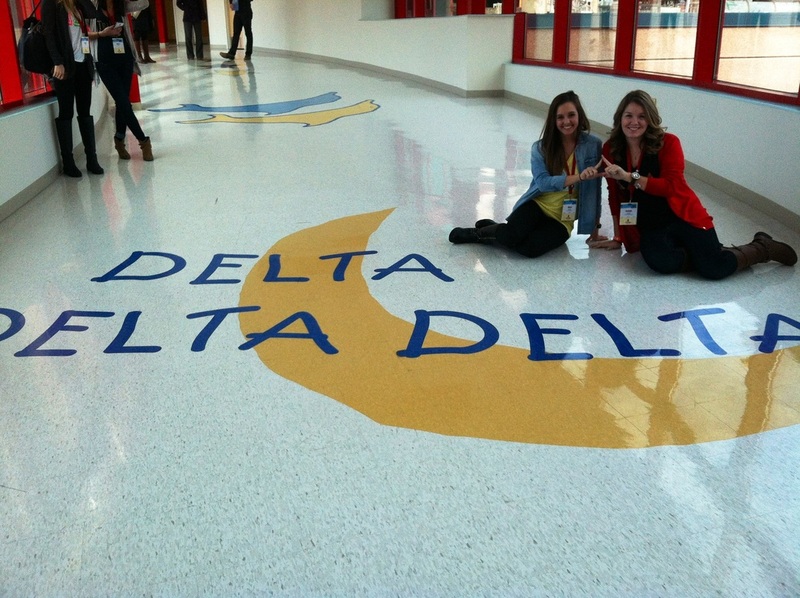 Becca and her chapter president on the Tri Delta floor at St. Jude. 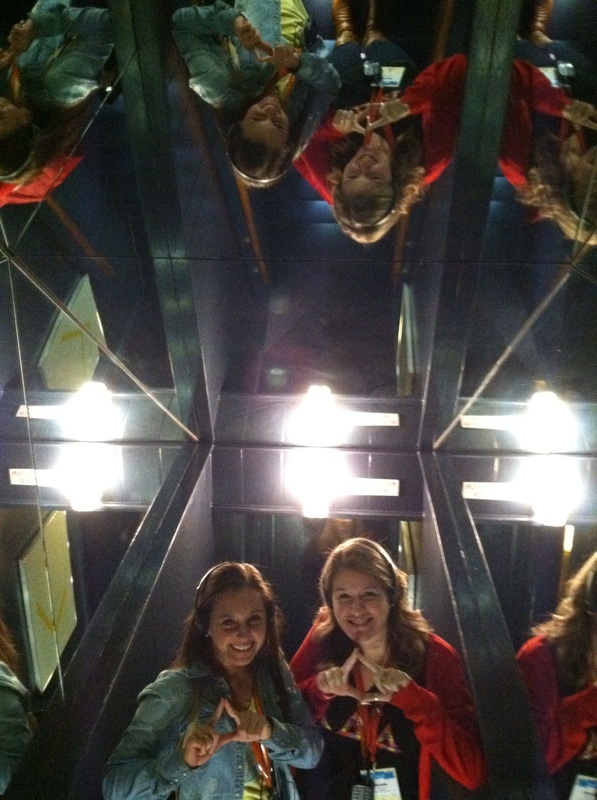 Becca and her chapter president in the mirrored staircase at Graceland. Can you figure out what the object being described by these clues is? That was object of the game “What’s Yours Like?” and it provided quite the challenge for the 14 ISU PRSSA members who attended the mentor/mentee game night. “What’s Yours Like?” is a game in which players give clues to describe common objects such as windshield wipers, jewelry and naps. The clues ranged from silly to creative and it was surprisingly difficult to figure out some of the objects. Some players figured out their objects in as little as three clues while others needed hints from everyone, which often proved more confusing than helpful. Mentors and mentees alike enjoyed themselves at the game night. 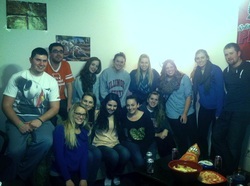 It was a casual, low-key way for PRSSA members to get together, have fun and get to know each other a little better. By the way, the answer from above is a dishwasher. 1. 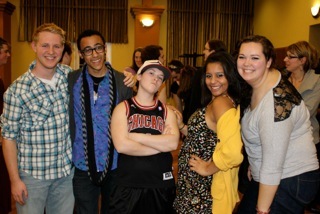 What is your fondest memory of PRSSA? There are too many to choose just one! 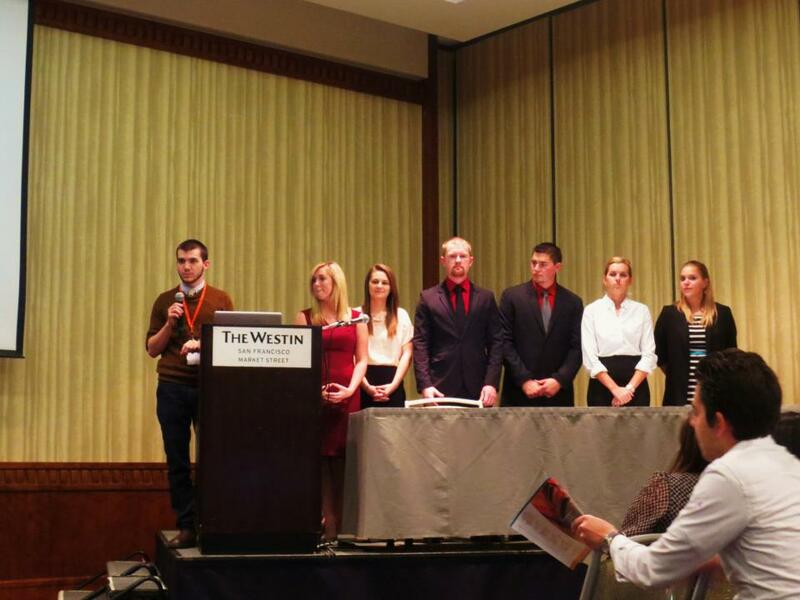 But I guess I would have to say that the PRSSA National Conference in San Francisco in October would be my favorite. 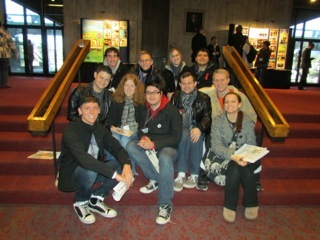 The members that attended represented our Chapter incredibly well. Our executive board presented a Chapter Development Session—one of only six Chapters in the nation—on building a stronger e-board, which was great to be a part of. Our Chapter also won the Star Chapter Award for the second year in a row. Besides the Chapter’s overall accomplishments, I was able to get to know members much better and become close friends with many of them. 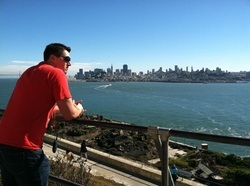 Plus, sight-seeing around San Francisco was an awesome experience and one that I will never forget. 2. 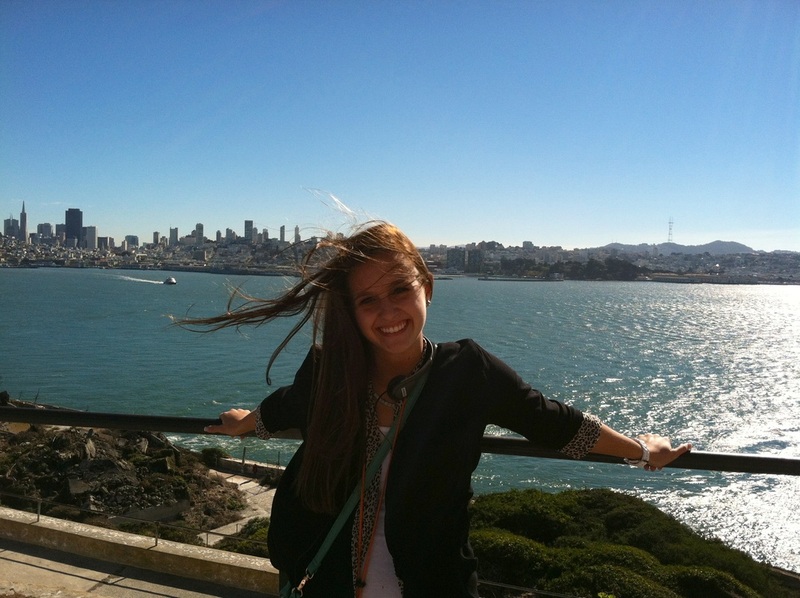 Why did you choose PR for your major? I first came to ISU as a journalism major because I spent my time holding editor positions on all three publications at my high school. However, after working at the Daily Vidette as a news reporter my freshman year, I found that being a journalist wasn’t as fulfilling as it had been previously. I searched for other career options within the School of Communication and gave public relations a try. PR ended up being a perfect fit for me because I have always been fascinated by branding, corporate image, event planning, social media, journalism, and communication. It encompasses everything I am passionate about, and the field is so diverse that I could never get bored with it. 3. What is one thing that most people don’t know about you? I am terrified of squirrels. I had a dream when I was young that thousands of squirrels were kissing me, and since then I freak out whenever I see one. You can imagine how difficult it is for me to walk through the quad on a daily basis with the unusually large amount of those furry fiends running around. 4. What are you most proud of in your academic career? Although I am honored to have received a leadership position in our Chapter and an internship, the one that stands out to me is when I received the position of staff writer for the Daily Vidette. I applied my first couple weeks of freshman year, went in for an interview, and got the job. I knew no one on the staff before applying, had no connections to help me get the job, and was a timid, new student at ISU. So I was shocked I became a writer for an award-winning campus newspaper. After a year of working for the Vidette, my confidence level increased because I constantly had to interview professors, deans, politicians, doctors, students, etc. 5. 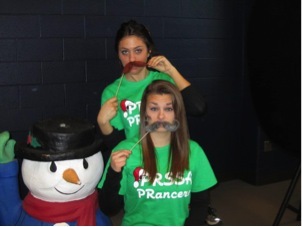 In what activities do you partake at ISU, and has PRSSA helped you get there? 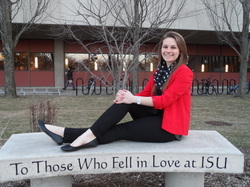 At ISU I am currently in my second year as a student blogger for Office of Admissions, and I am the secretary of public relations for the Student Government Association (SGA), in addition to being the vice president of PRSSA. Being a member of PRSSA is the reason I have received the opportunities I have through networking with current and past members. PRSSA also provides me with the tools and an unwavering support system on how to accomplish everything that I have set out to do. I have always dreamt about going to Sweden. My great-grandmother Dagmar (from whom I received my middle name) emigrated from Sweden but died shortly before I was born. Even though I have never met her, I have always felt a strong connection to her, and my hope is that by traveling to her homeland it will strengthen that connection. 7. What is your favorite class you have ever taken or helped teach? My favorite class was COM 178: Introduction to Public Relations. Mr. Tom Lamonica, along with the teaching assistants, Michelle Ketcham and Genevieve Prendergast, and graduate assistant, Kim Stagg, were responsible for sparking my interest in public relations. I learned so much from them and from the class in general. It was always fun and very informative. 8. If you could have any talent aside from PR, what would it be? I wish I could play guitar. I have tried to learn many times before, but unfortunately, I do not have a musical bone in my body. Composing songs just seems like a great outlet. I am a fan of every kind of music, except for screamo death metal and musicals, which in my opinion, both sound about the same. I can rock out to country music one day and be singing (horribly might I add) the latest pop song the next. Some of my favorite artists and bands include Coldplay, Taylor Swift, The Script, The Band Perry, Kid Cudi, Ingrid Michaelson, and Mumford and Sons. 10. What advice would you give to an aspiring PRSSA member or E-Board member? Seek out someone to be your mentor. 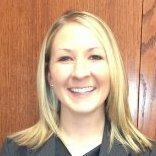 My PRSSA mentor, 2011-2012 President Michelle Ketcham, inspired me to run for an e-board position and helped me pick the right internship. Finding a positive figure who can guide you through PRSSA, college and even your life can make all the difference. Also, you are going to experience the pressure that every PR or communication student endures. The pressure to take on a million different internships, leadership positions, PR opportunities, etc. I urge you to only take the opportunities that fulfill you and that you are passionate about. Don’t overextend yourself. Accepting a leadership position just to add another accomplishment to your resume will lead to many frustrating, crying nights…trust me. Being vice president of PRSSA and working with five extremely talented and passionate e-board members only furthered my love of PR. 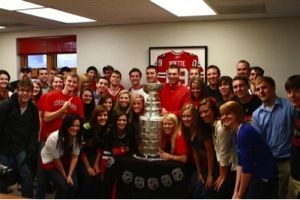 The 2010 Daily Vidette staff got a visit from Jay Blunk and the Stanley Cup. That experience was one of the many perks of working on the newspaper my freshman year. Me and some members of the Student Government Association, an opportunity I learned about through a PRSSA member, Allyson Corona. My PRSSA mentor, 2011-2012 President, Michelle Ketcham.